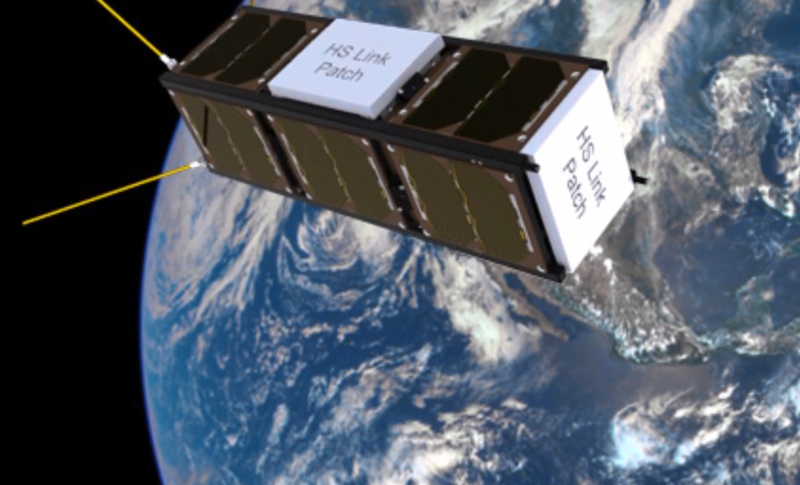 CPOD LEO 2019 Docking with 3U nanosatellites. Will demonstrate precision flying around each other and then docking. Will enable to explore asteroids, moons and to inspect other spacecraft. 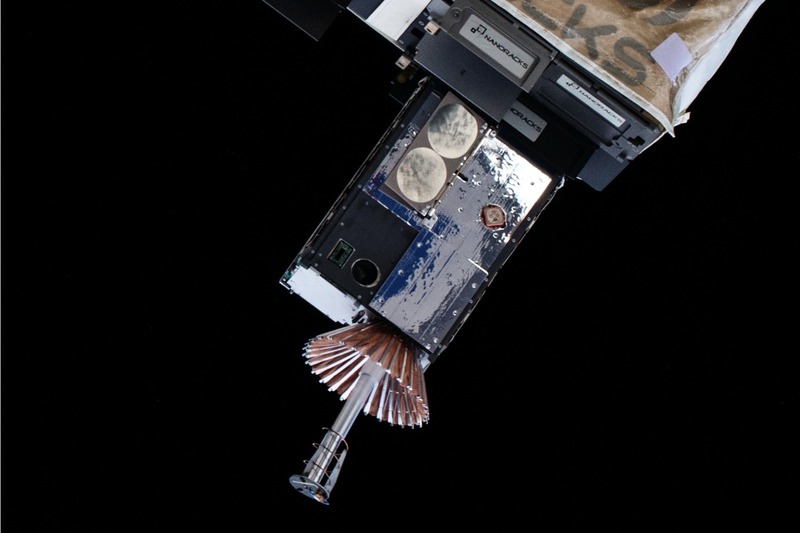 RSat (Repair CubeSat) LEO 2019 Two 7 DoF robotic arms fitted with manipulators to enable inspection and servicing. Operates with BRICSat that provides propulsion and attitude control. Magnetic docking system will include power and data pass-through. 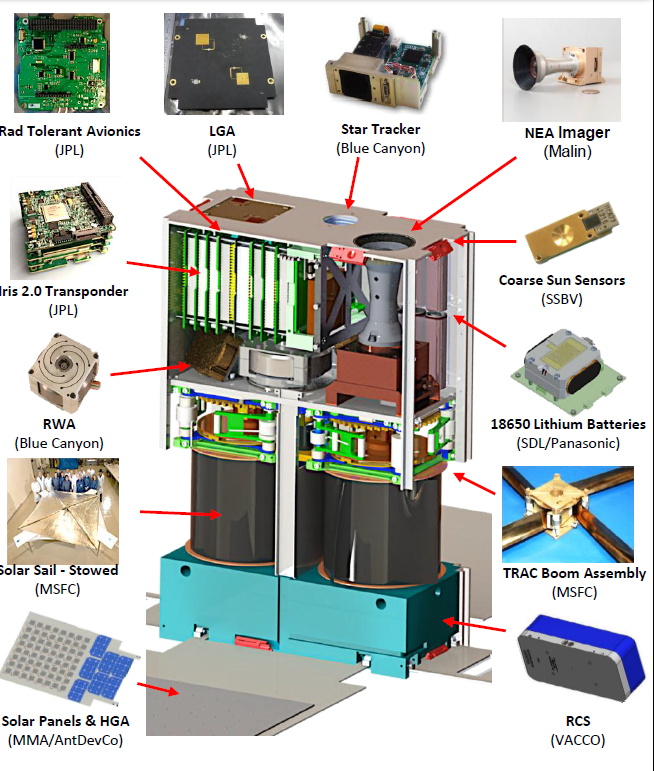 Part of AMODS (Autonomous Mobile On-orbit Diagnostic System). 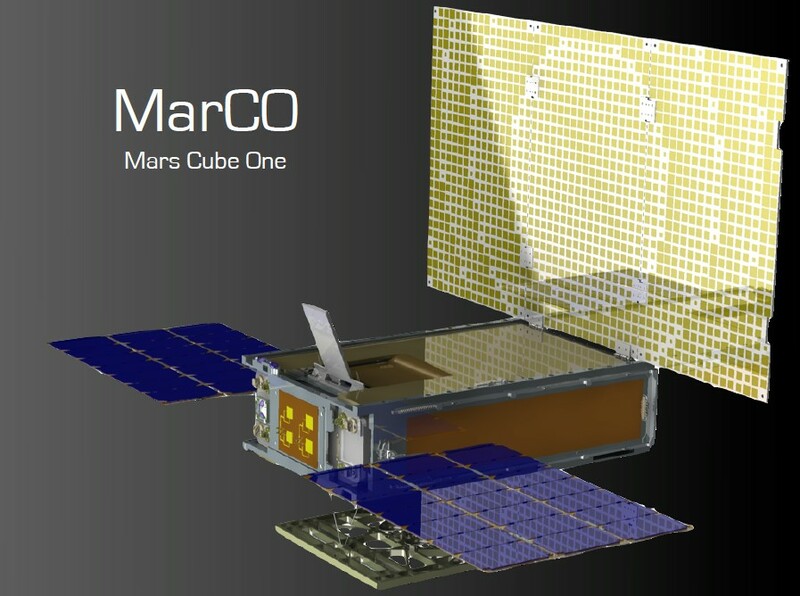 Mars Cube One (MarCO) Mars flyby 2018 Two 6U deep space CubeSats were planned to be launched in 2016, but delayed due to InSight Mars lander. They flew by Mars during the landing of InSight and relayed status in real time. 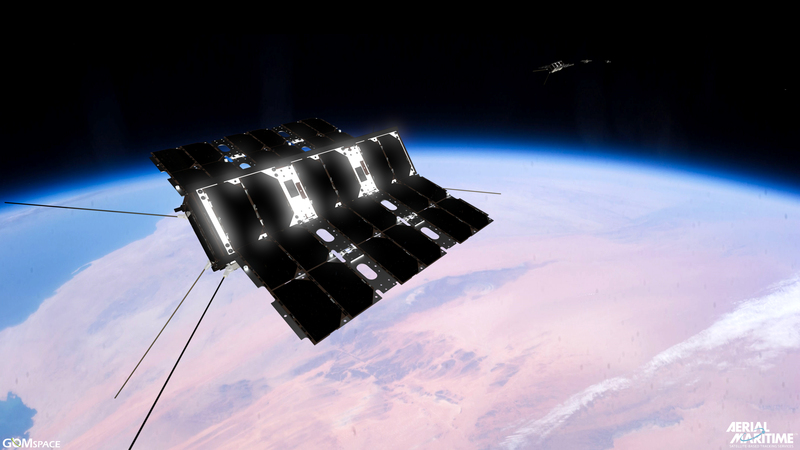 First interplanetary CubeSats. 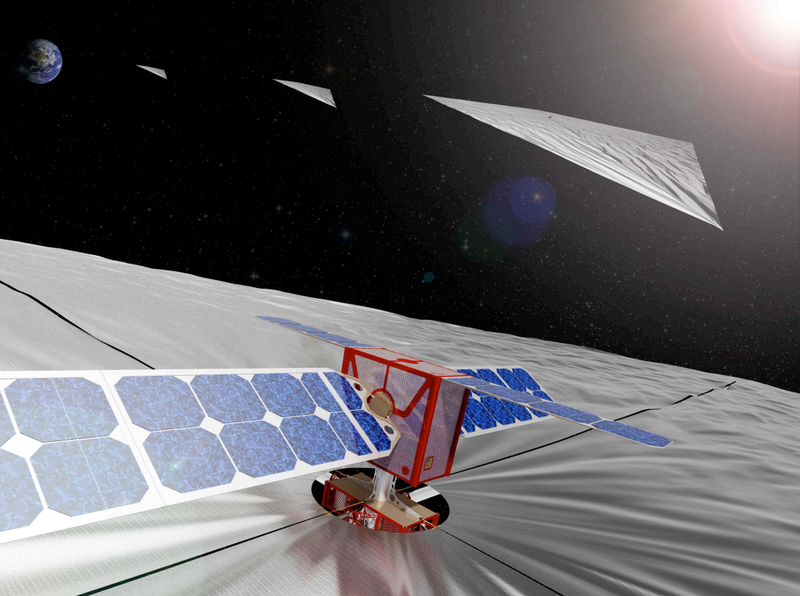 NEA Scout Asteroid flyby 2020 First CubeSat to reach an asteroid and map it using an ~80 m2 solar sail for propulsion. One of 13 6U CubeSats that will launch with a new NASA SLS rocket in 2020 which will send Orion capsule on a trip around the Moon. 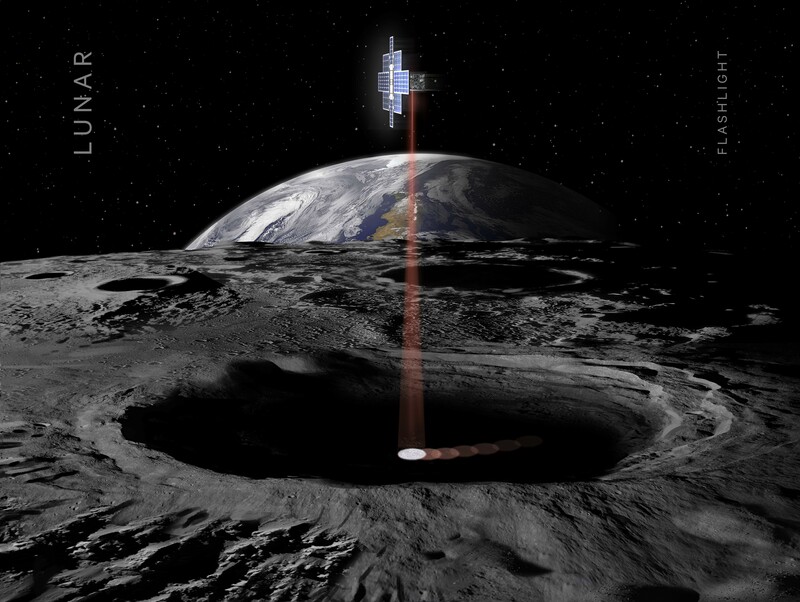 Lunar Flashlight Moon orbit 2020 First CubeSat to reach the Moon and the first to use lasers to look for water ice. Near infrared lasers will shine light into the shaded polar regions, while the spectrometer measures surface reflection and composition. One of 13 6U SLS CubeSats. 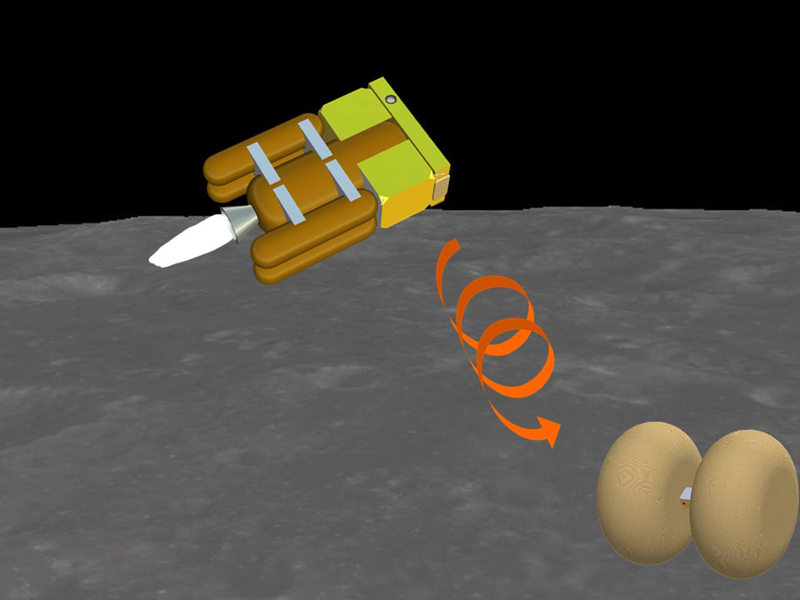 OMOTENASHI Moon orbit, Moon surface 2020 Will release a 1 kg lunar lander with inflatable airbags to demonstrate technology for low-cost and very small spacecraft to explore the lunar surface and will measure the radiation environment. One of 13 6U SLS CubeSats. 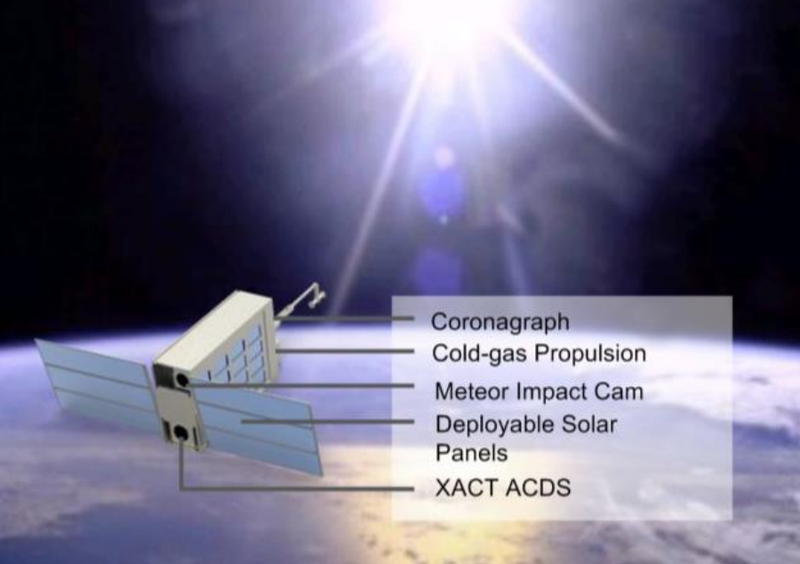 SWIMSat GEO 2021 6U CubeSat to monitor solar Coronal Mass Ejections (CMEs) and monitor Earth meteor impacts. 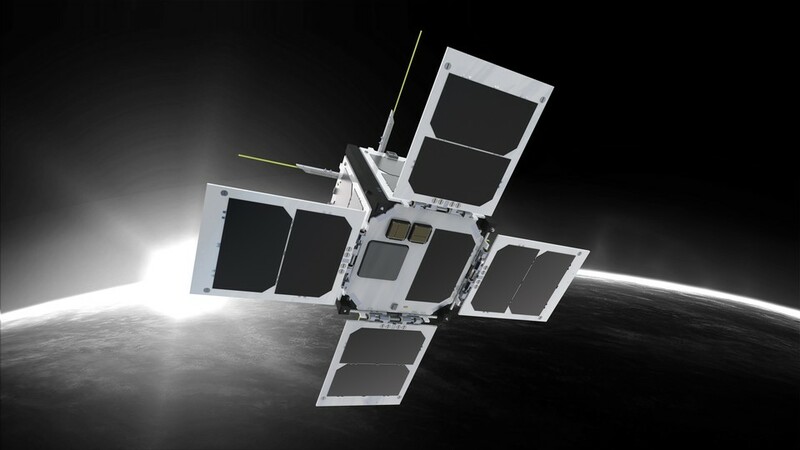 Might be the first CubeSat to geostationary (GEO) orbit, but too early to know for sure. 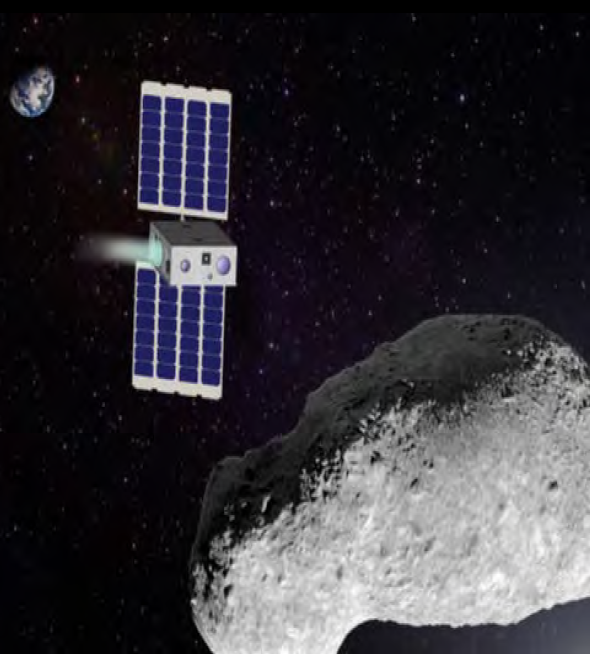 M-ARGO 50-m asteroid 2022 12U CubeSat from ESA to rendezvous with a small rapidly spinning asteroid and spend around six months surveying with multispectral imager and laser altimeter. 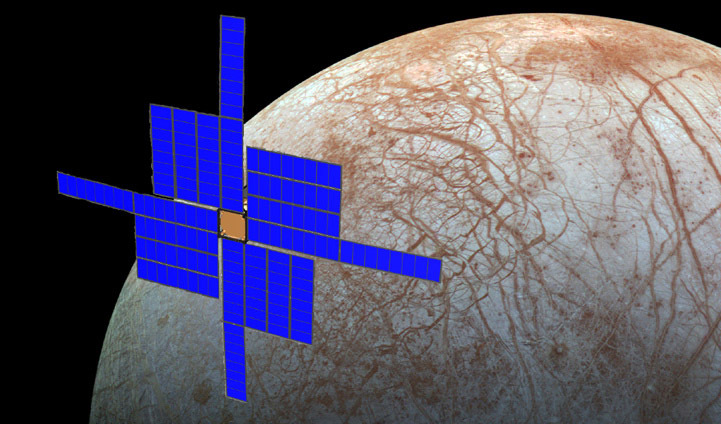 DARCSIDE Europa, Jupiter moon 2025 3U CubeSat flying with Europa Clipper spacecraft to study Europa's atmosphere. 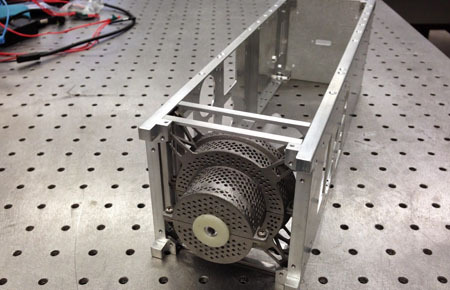 Experiments are planned to be drag measurement and high energy particle detector. Website NewSpace Index (www.newspace.im) includes microsatellites and smallsats as well! 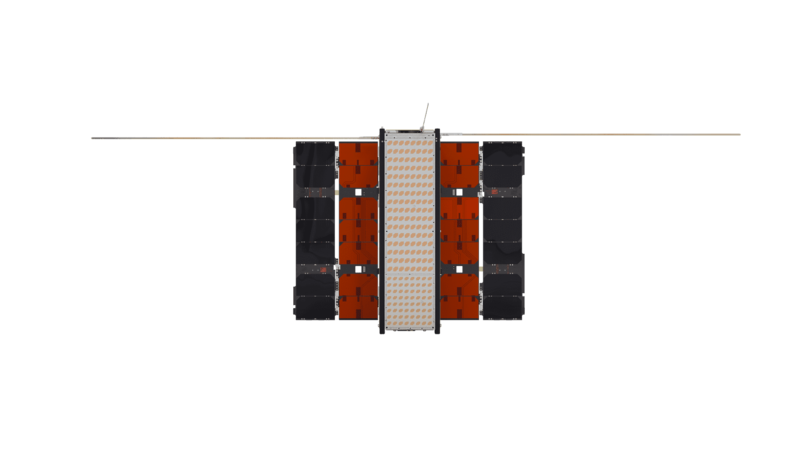 ExactEarth 67 / 67 2008 Nanosat, Hosted AIS Yes 9 own nanosats called AprizeSat or ExactView. Hosted payloads on 58 Iridium-NEXT satellites and 2 PAZ. Planet 355 / 150 2013 3U Earth observation $183 million 29 MP sensor taking images with 3.7 m ground resolution and swath of 24.6 km × 16.4 km from 475 km altitude. Spire 103 / 150 2013 3U Weather, AIS, ADS-B $149.5 million Measure change in GPS signal after passing atmosphere to calculate precise profiles for temperature, pressure, humidity. Astro Digital 6 / 25 2014 6U, 16U Earth observation $16.7+ million 6U has 22 m resolution in RGB and NIR. 16U has 2.5 m resolution in RGB, red edge, and NIR using one 70 MP sensor. Sky and Space Global 3 / 200 2017 8U IoT / M2M $11.5 million Plans to use inter-satellite links. Satellites outsourced from GomSpace. GeoOptics 7 / ? 2017 6U Weather $5.15 million Satellites outsourced from Tyvak. Helios Wire / SIRION 2 / 30 2017 6U, 16U IoT / M2M $1 million Uses 30 MHz of S-band spectrum to receive tiny data packages from billions of sensors. 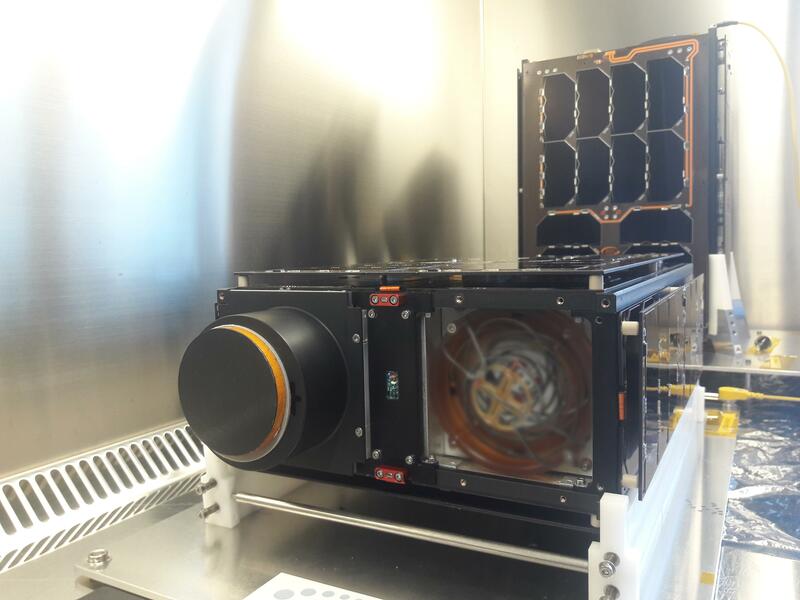 First payloads hosted on Astro Digital Corvus/Landmapper CubeSats. Dauria / SatByul 2 / 8 2017 6U Earth observation ? Perseus-O multispectral constellation. Many similarities to Astro Digital. 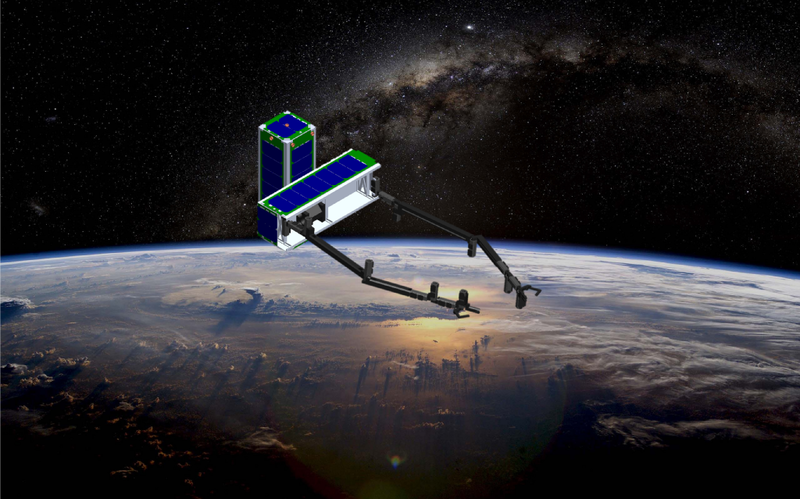 MKA-N could be considered the first CubeSats. Swarm Technologies 7 / 150 2018 0.25U, 1U IoT / M2M ? 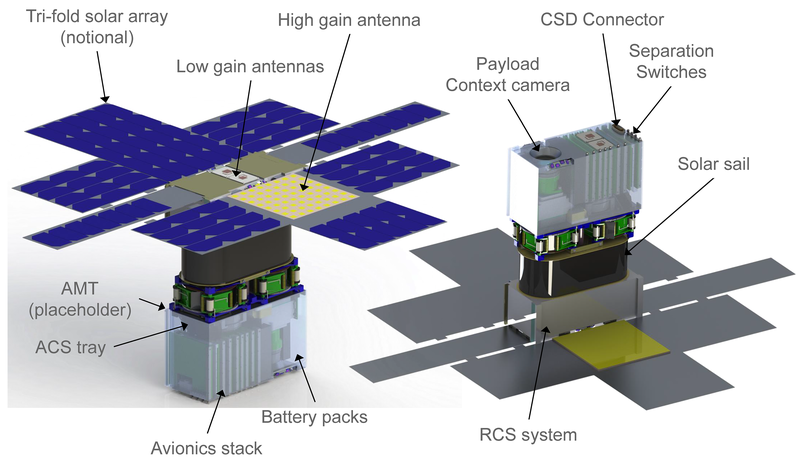 World's smallest two-way communication satellites. Kepler Communications 2 / 140 2018 3U, 6U, ? IoT / M2M, Internet $21 million Monthly fee based on the data amount. Hope to achieve rates of 1-40 Mbps. 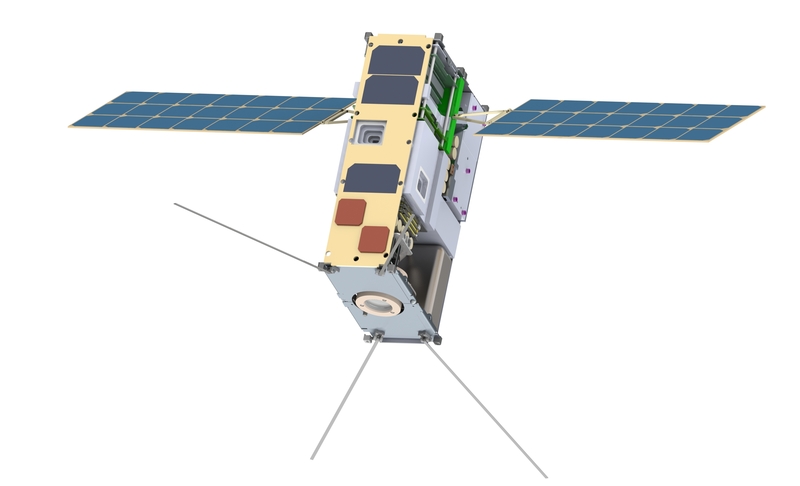 Clyde Space will provide at least the first 3 sats. Analytical Space 1 / ? 2018 6U IoT / M2M, Orbital data relay, Optical comms $4 million In-orbit relays receiving radio and downlink to ground with laser communication enabling more data downlink from satellites. Hiber 2 / 48 2018 6U IoT / M2M $6.2 million Send small packets of data (140 characters, accompanied by time‐stamp, identifier and location). Fleet Space 4 / 100 2018 3U, 12U, 1.5U IoT / M2M $3.7 million Selected Saber Astronautics as the operations provider. Astrocast 1 / 80 2018 3U IoT / M2M $7.1 million Targeting L-band. Inter-satellite links. NanoSpace propulsion. Further 80 satellites in orbit by 2022. AISTech 1 / 150 2018 2U, 6U IoT / M2M, ADS-B, AIS, IR imaging $0.31 million 2-way comms, thermal imaging to detect forest fires, aviation tracking (ADS-B). Satellites will be built by GomSpace. Reaktor Space 1 / 36 2018 6U, 2U Earth observation, Hyperspectral ? Hyperspectral constellation for smart agriculture with 100's of spectral bands and 20 m resolution. Karten Space 0 / 14 2019 6U Earth observation, AIS ? Optical resolution is 3-5 m.
UnSeenLabs 0 / ? 2019 6U RF spectrum monitoring ? Satellites outsourced from GomSpace. NSLComm 0 / 60 2019 6U Internet, IoT / M2M $9.25+ million Up to 1 Gbps anywhere in the world with a novel antenna. Orbital Micro Systems 0 / 40 2019 3U? Weather $0.65 million Utilizes microwave technology to capture temperature and moisture measurements, refreshed and delivered every 15 minutes. Blink Astro 0 / ? 2019 3U IoT / M2M ? 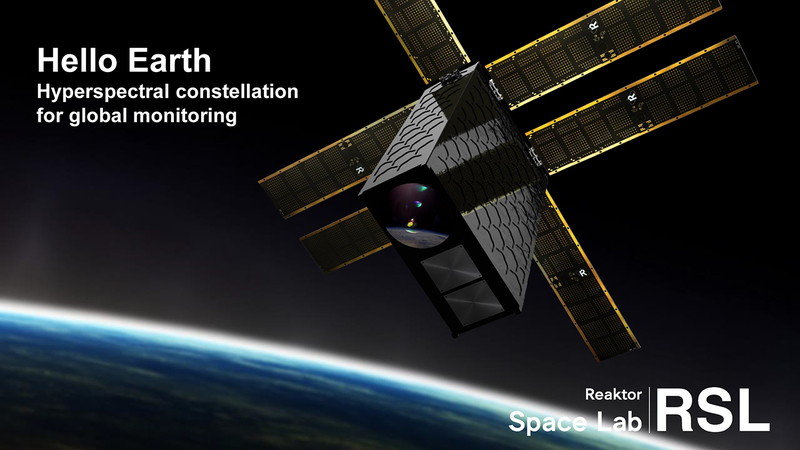 Blink Astro and NanoAvionics have signed an agreement to fly a tech demo payload to LEO in fall 2018. PlanetiQ 0 / 18 2019 6U Weather $5+ million Based on GPS radio occultation. Will have microwave spectrometer & radiometer. 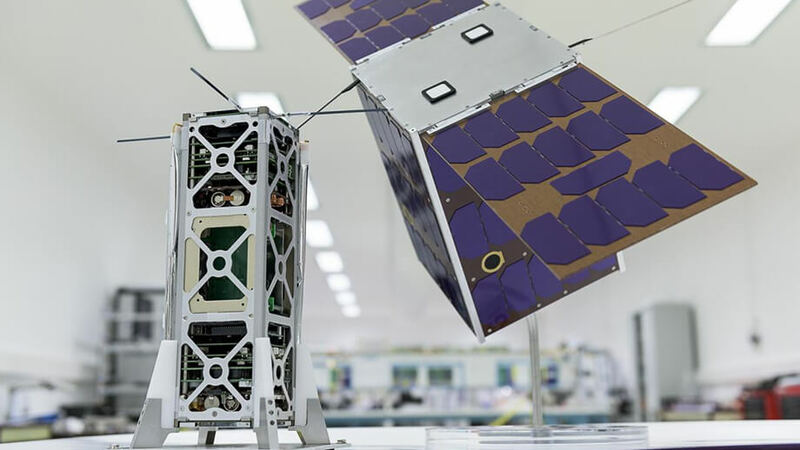 Blue Canyon Tech builds satellites. 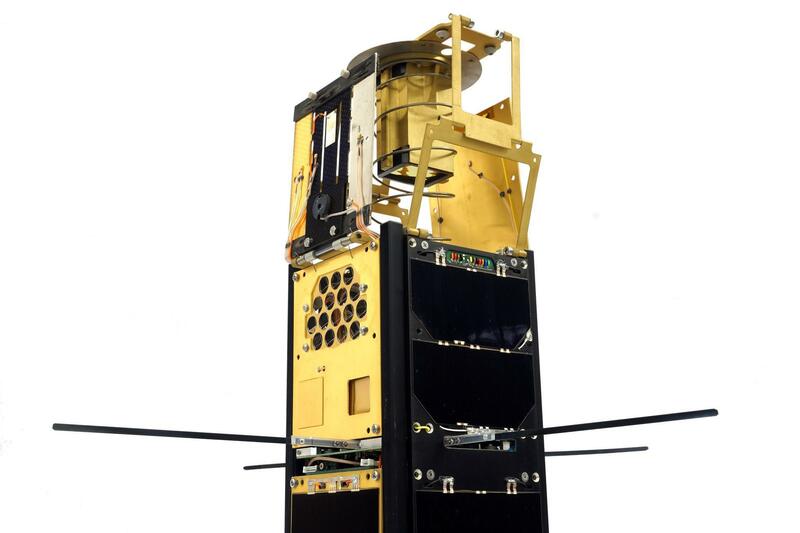 Hera Systems 0 / 50 2019 12U Earth observation $4.2+ million Capable of 1-meter resolution with 22-kilogram form factor. SRT Marine 0 / 6 2019 6U AIS ? Scanning technology will enable the detection of vessels without an identification transceiver. Clyde Space will build the spacecraft. SatRevolution 0 / 66 2019 2U Earth observation $0.8 million Imaging the Earth in 4m resolution through the use of an innovative lens. Aerial & Maritime 0 / ? 2019 3U? AIS, ADS-B $12.2 million Monitoring aircraft (ADS-B) and vessels (AIS) from 37°N to 37°S. GomSpace is shareholder and will develop satellites. Cooperation with Flightradar24. Harris 0 / 12 2019 6U Weather Yes, ? 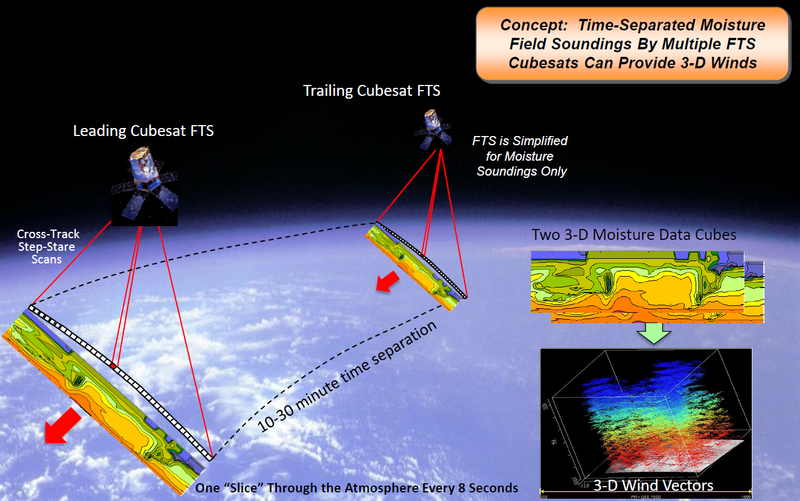 Immediate access to 3D wind data sets from Harris-owned HyperCubes. Utah State University provides the spacecraft. Transcelestial 0 / ? 2019 CubeSat? 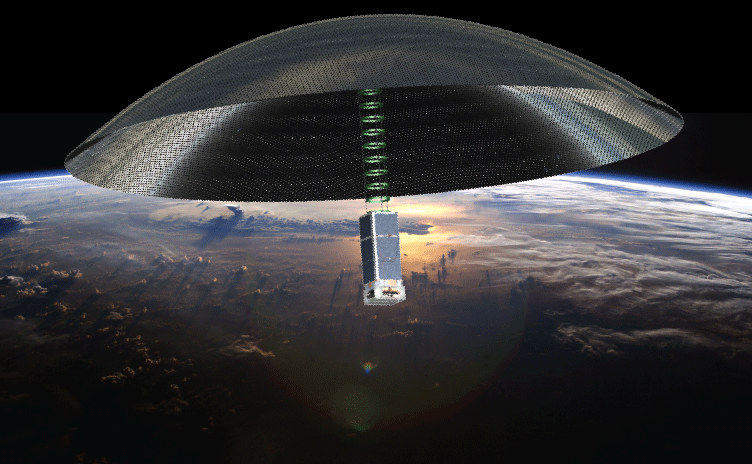 Orbital data relay, Optical comms $1.8 million Space data network for terrestrial and satellite applications. 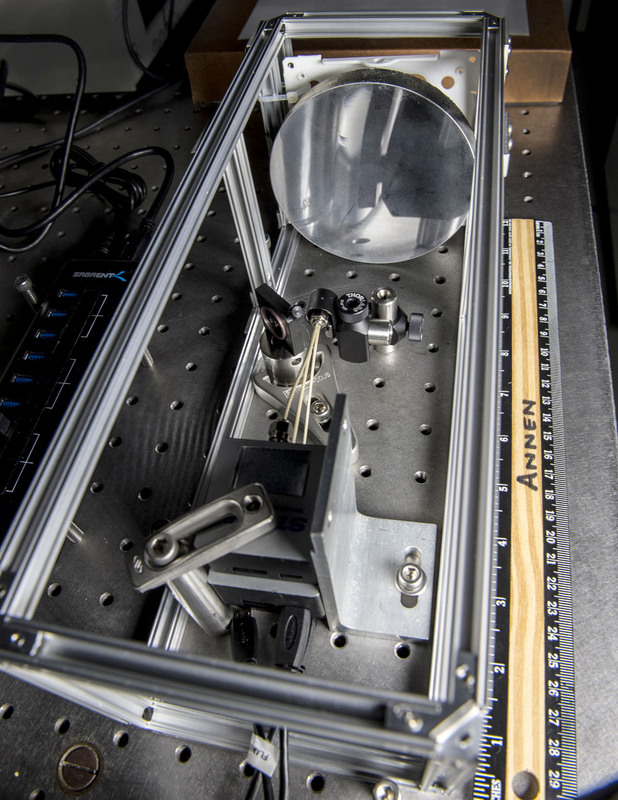 Using lasers to transfer data at up to 1000x faster than currently available. 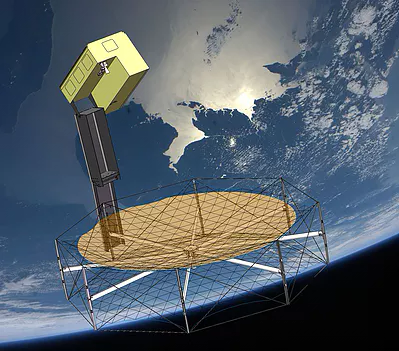 Kleos Space 0 / 20 2019 CubeSat AIS, Geolocation ? 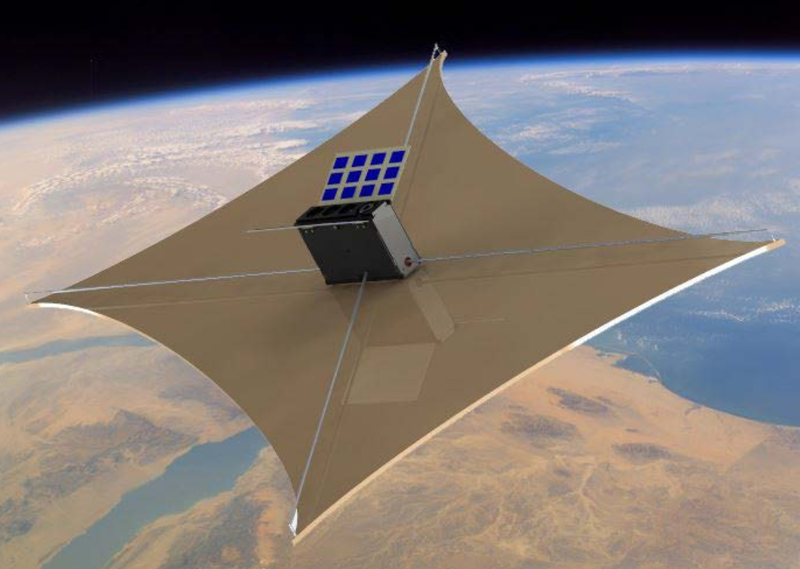 Radio data collection spacecraft with our patented In-Space Manufacturing technology, a miniature machine that manufactures enormous composite booms used to deploy antenna. Strata Space 0 / ? 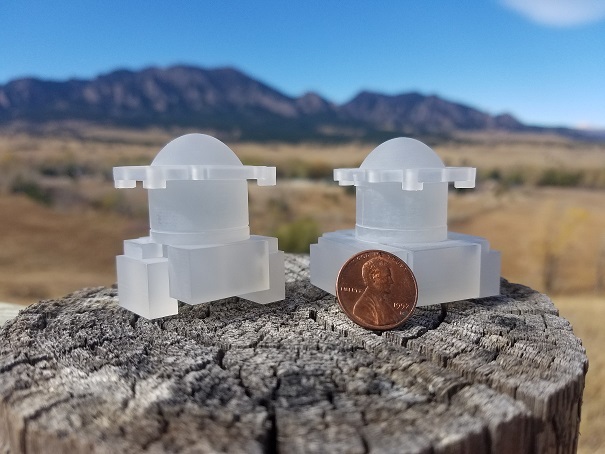 2019 PocketQube Orbital data relay, Data storage ? Constellation to service other space users with high speed real-time data connection, storage, and computation. First 2 made by Alba Orbital. Kineis 0 / 20 2020 16U IoT / M2M Yes Two-way communications and propulsion. 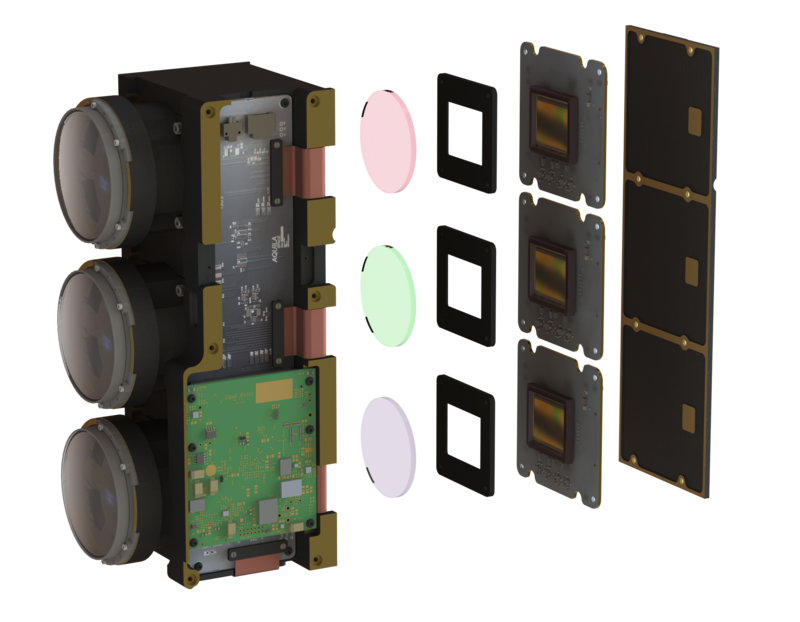 orora.tech 0 / 100 2021 3U Weather, IR imaging Seed New patent pending CubeSat framework with high-end imaging sensors to accurately measure both surface temperatures and cloud coverage. OQ Technology 0 / ? ? 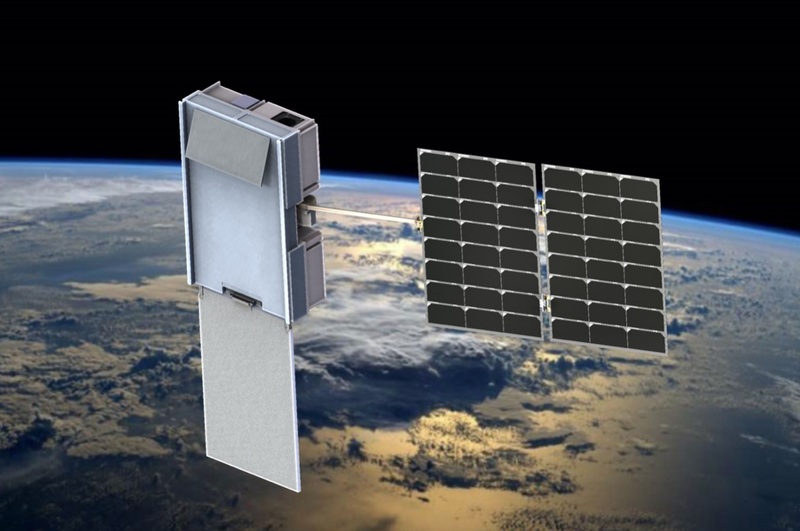 CubeSat IoT / M2M World's first universal plug & play IoT device that can provide connectivity leveraging Low-Earth-Orbit satellite infrastructure. Tekever 0 / 12 ? 16U Earth observation, AIS, ADS-B, IoT / M2M ? 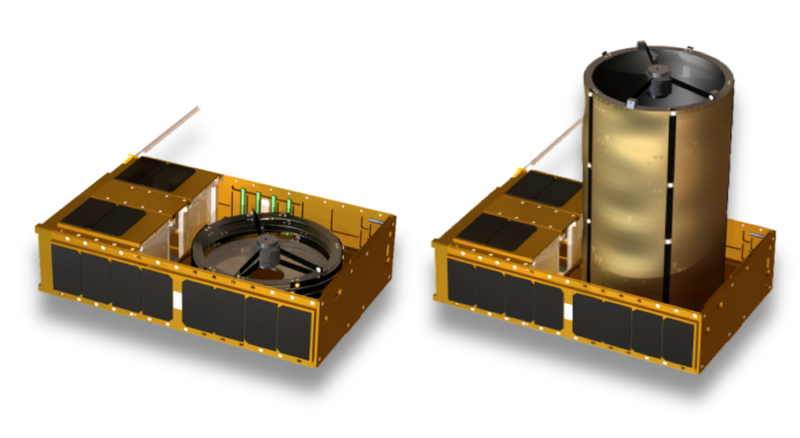 Constellation will carry the same observation and telecom payloads as Infante, but with different payloads on different satellites. ArQit 0 / ? ? CubeSat? QKD, Optical comms ? Quantum Key Distribution shared in laser transmissions from a satellite. Qinetiq is contractor for spacecraft. Alba Orbital 0 / ? ? 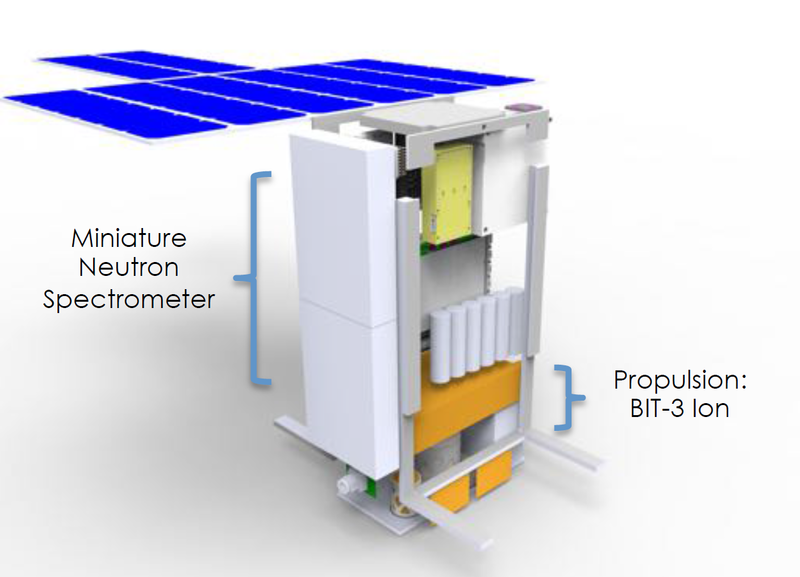 PocketQube Earth observation ? First PocketQube constellation. Ubiquitilink 0 / ? ? 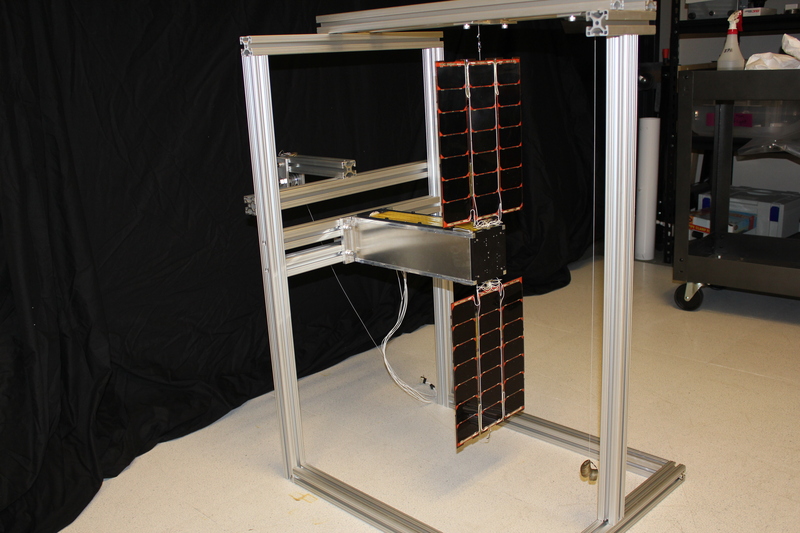 CubeSat IoT / M2M Yes Leverage nanosatellites in a unique manner to provide connectivity anywhere on the planet. Hypercubes 0 / ? ? CubeSat? Earth observation, Hyperspectral ? Track not only the chemical output of factories and farms, but also the movement of machines and equipment. Koolock 0 / ? ? CubeSat Earth observation, IR imaging, Weather ? The most advanced feature set for weather and environmental monitoring. Rupercorp 0 / ? Cancelled 6U Earth observation ? 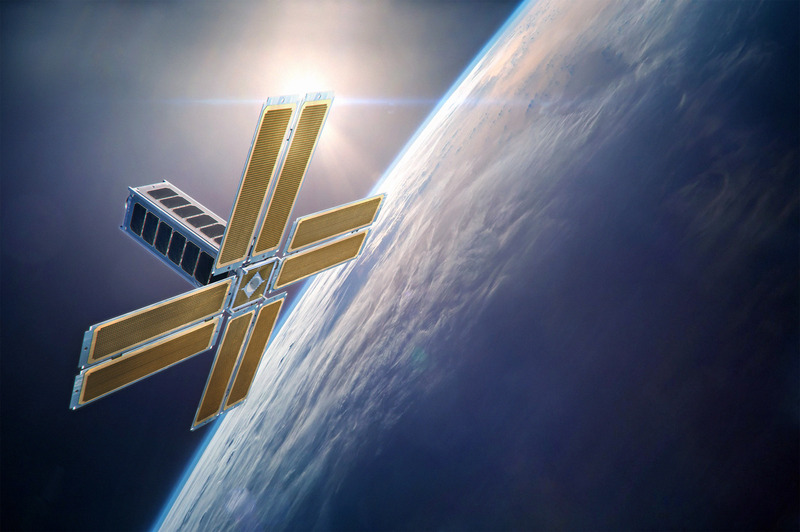 2U CubeSat to be launched in 2018 will be a precursor for the commercial constellation. No news since press release and company does not seem to have any online presence. 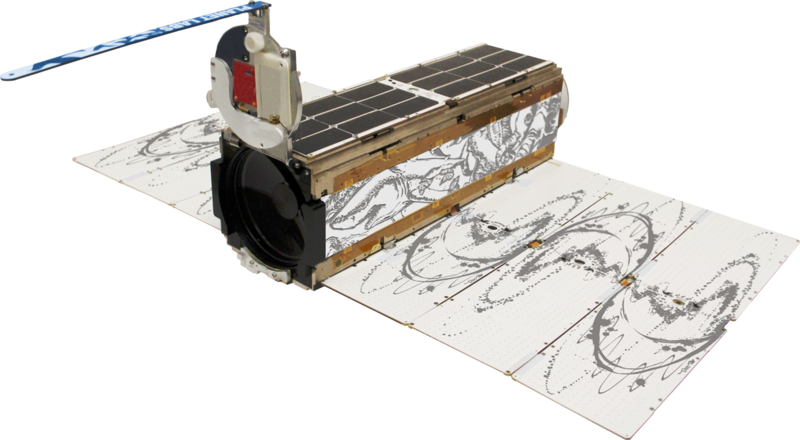 Planetary Resources 3 / 10 Cancelled 12U Earth observation $50+ million Visible-NIR 40 channel hyperspectral imager with 10 m resolution. Midwave infrared imager (MWIR) in 3-5 μm with 15 m resolution. Has been deprioritized for asteroid missions. Outernet 0 / 200 Cancelled 1U, 3U Internet Yes Broadcast free data from space. Revenue from ads, premium content and hardware sales. Cancelled in 2017 due to lack of launch funding. 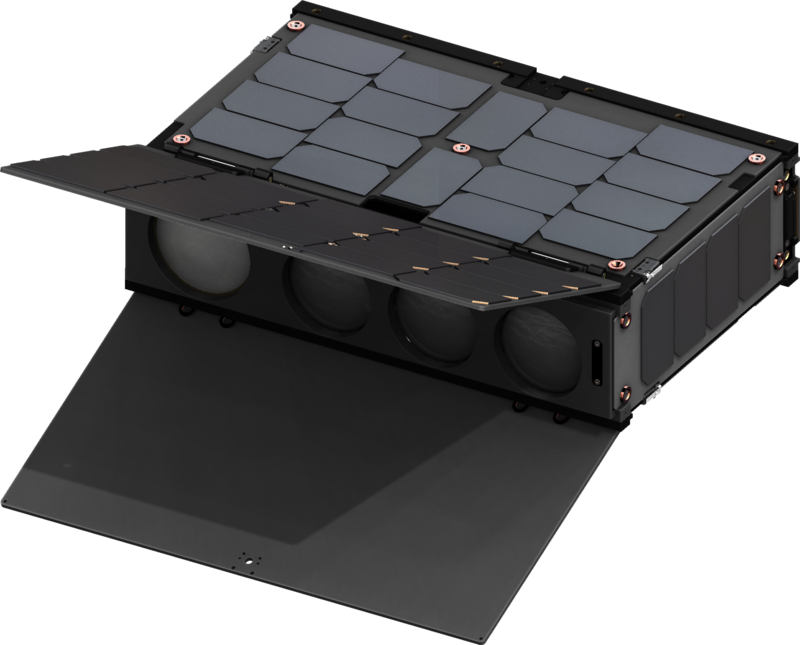 Earthcube 0 / 10 Cancelled CubeSat Earth observation, IR imaging $4.5+ million Might use Exotrail thrusters. Terran Orbital (Tyvak) 0 / ? 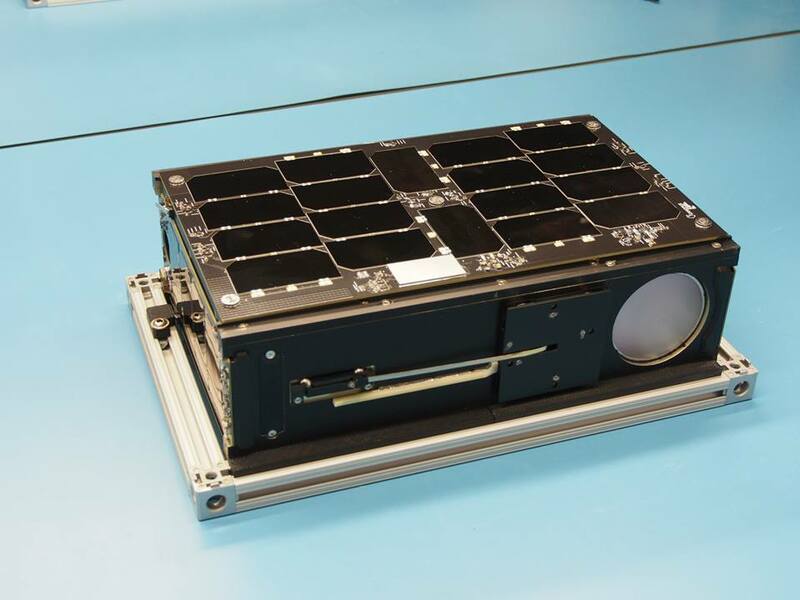 Cancelled CubeSat IoT / M2M Yes Building a constellation of best-in-class nanosatellites that will form an unprecedented data infrastructure in space. ISIS / Innovative Data Services 0 / 16 Cancelled 3U AIS ? AIS payload tested on Triton-1 and network planned for a while, but no recent news. ADS-B, M2M and asset tracking also considered. Promethean Labs 0 / ? 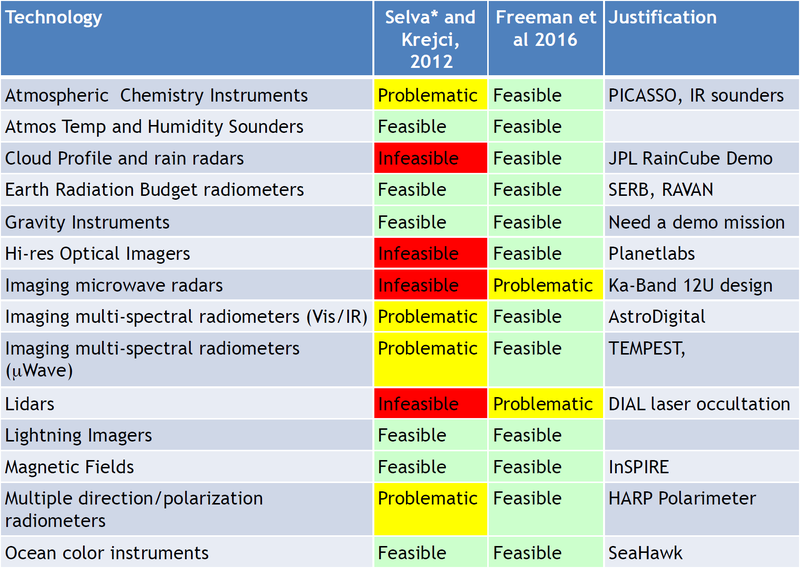 Cancelled CubeSat Emissions monitoring ? Special imager for measuring greenhouse gas (GHG) emissions, monitoring of water and air quality, forestry and land. BitSat (Dunvegan Space Systems) 0 / 24 Cancelled 3U IoT / M2M, Data storage ? Providing communications, data processing, storage and broadcasting capabilities in space. Cancelled when fundraising fell through. 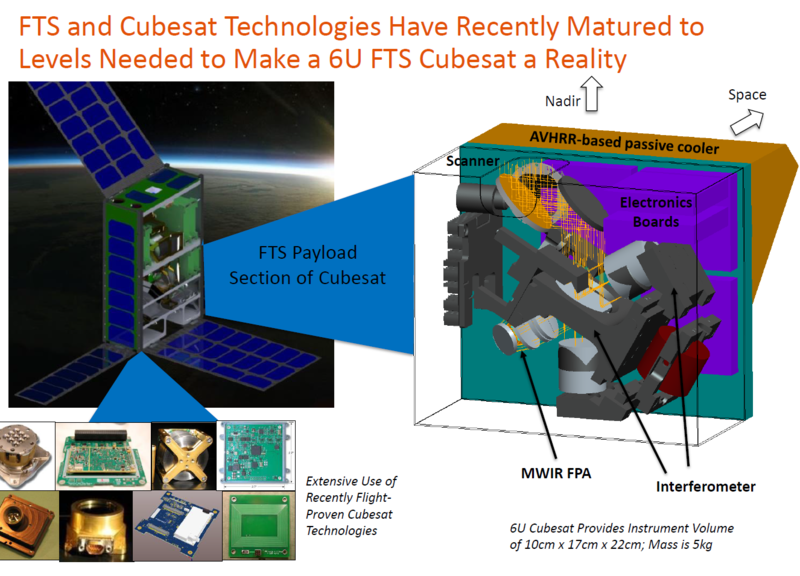 Complimentary reading: NASA Small Spacecraft Technology State of the Art (online version) and Achieving Science with CubeSats reports. Communications Planet 200+ Mbit/s to 5 m ground station in X band with patch antenna. 62.5 Mbit/s proof from 2015. Up to 10 GB per pass with new helix antenna. X-band in orbit since spring 2013. 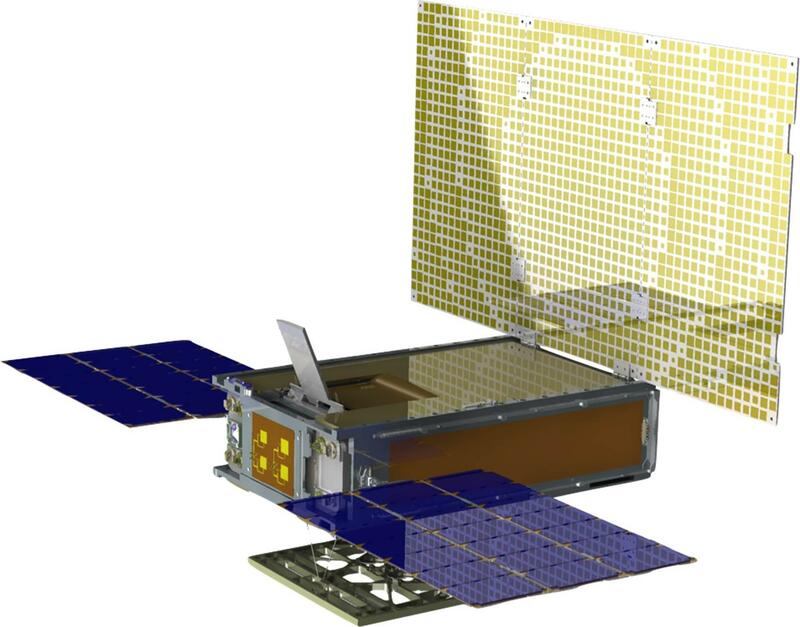 NASA Mars Cube One (MarCO) reflectarray capable of 8 Kbit/s from Mars in X-band. Three 33.3 cm x 19.9 cm panels achieve >28 dB gain at 8.4 GHz. Launched in 2018 and operational. NASA KaPDA parabolic deployable Ka-band antenna with 0.5 m diameter, 1.5U stowed size, 1.2 kg mass and 42.5 dB gain. NASA Iris V2 Transponder. Parameters include 0.5U, 1.2 kg and interoperability with Deep Space Network (DSN) at X-band. Astro Digital (Aquila) 40 Mbit/s in 26.8 GHz Ka-band with patch antenna on Perseus-M 6U CubeSats. Module is about 1U and 1 kg. 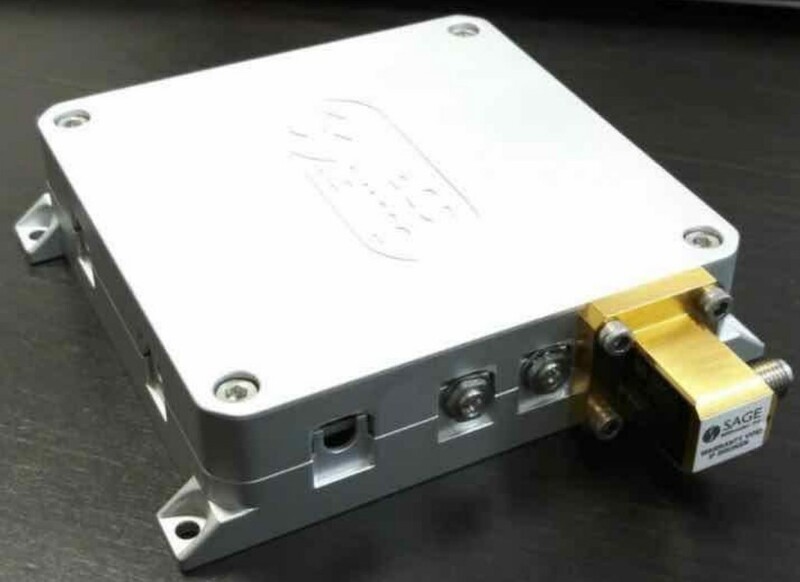 Aerospace Corp 1.5U AeroCube-7 (OCSD) will do optical communications with data rates up to 622 Mbps using 80 cm ground station. Demonstrated on OCSD B and OCSD C (AeroCube-7) in 2018 achieving 100 Mbps. Syrlinks EWC27 X Band transmitter. Up to 100 Mbps. Up to 13.3 GB per pass can be downloaded on a 5 m station or 5.8 GB with a 3.4 m station. 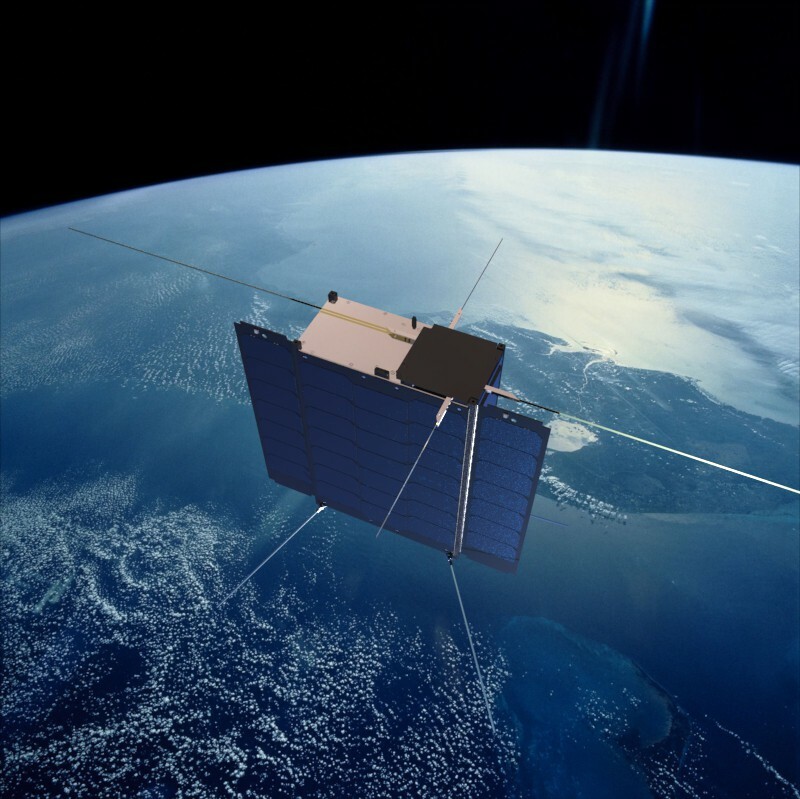 QuickSAT (Globalstar) Using GlobalStar satellite network for 24/7 communications. Module is only 44 × 88 mm, weighs 25 g and consumes 200 mW with 500 mW peak. Flown on TSAT, GEARSS 1, GEARRS 2 and planned for many more. Tendeg 1 m apeture, scalable to 2-4 m. 50 dB gain at 36 GHz, 2.5 kg, 3U. 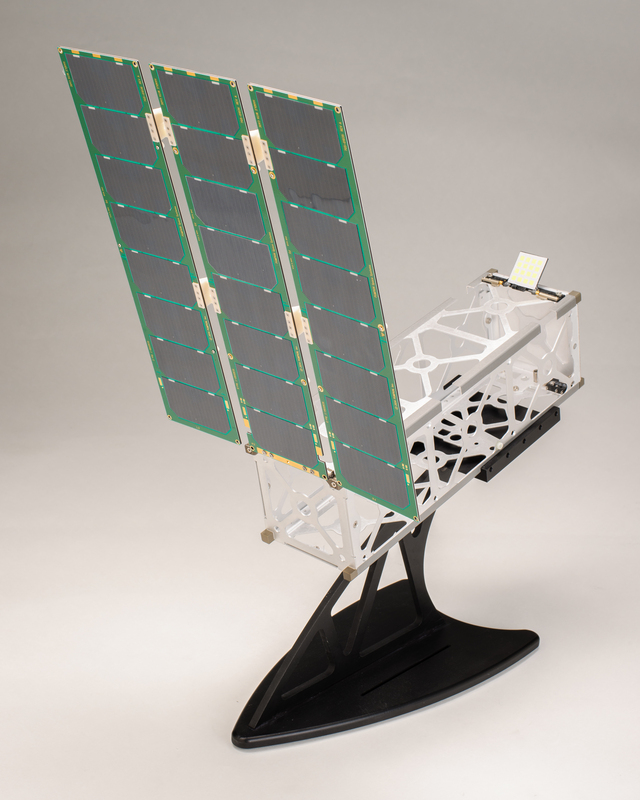 Exclusive licensee of NASA JPL’s KaPDA Ka-Band CubeSat antenna. KaTENna flight in 2018. Tethers Unlimited K-Band Transmitter for up to 500 Mbps. 0.3U and 0.5 kg. Delivered to the first customer. 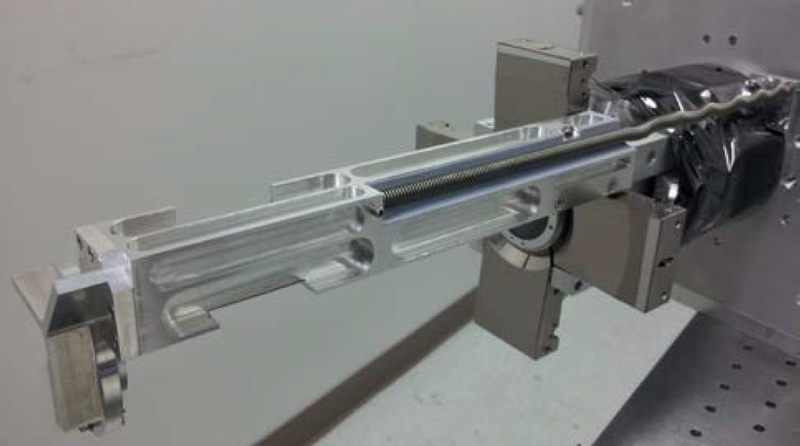 Tesat CubeLCT laser transmitter for CubeSats. 0.3U, 0.35 kg, 8W and 100 Mbps with 1 deg pointing. Demonstration mission planned for the end of 2018. 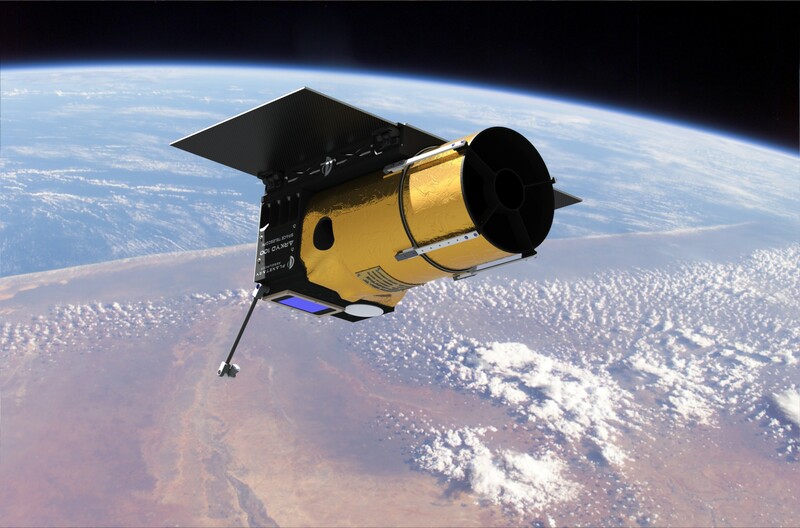 Kepler Communications Fastest CubeSat? Ku-band of 320 Mbps downlink & 100 Mbps uplink. Demonstrated on KIPP and even faster speeds planned on future missions. 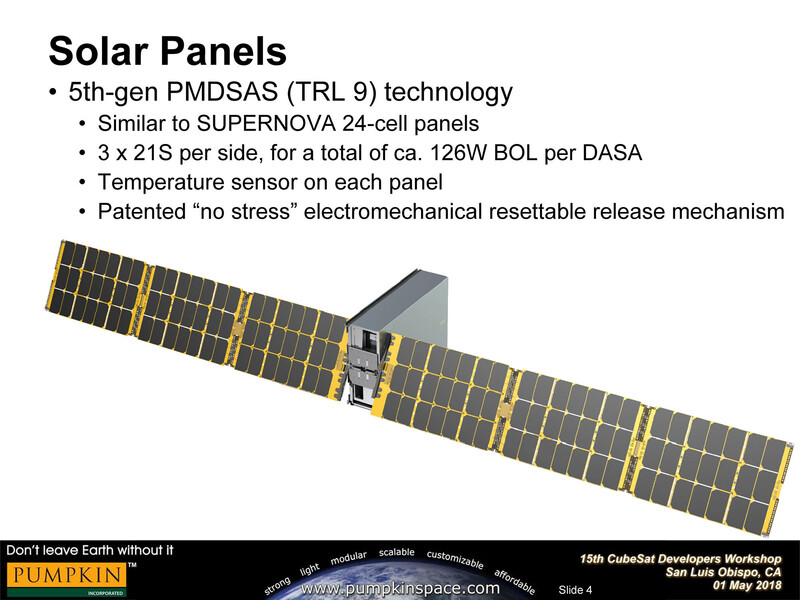 MMA Design HaWK steerable 3 × 3U solar arrays capable of tracking Sun and 36W peak power. Might use Honeybee SADA drive actuator. 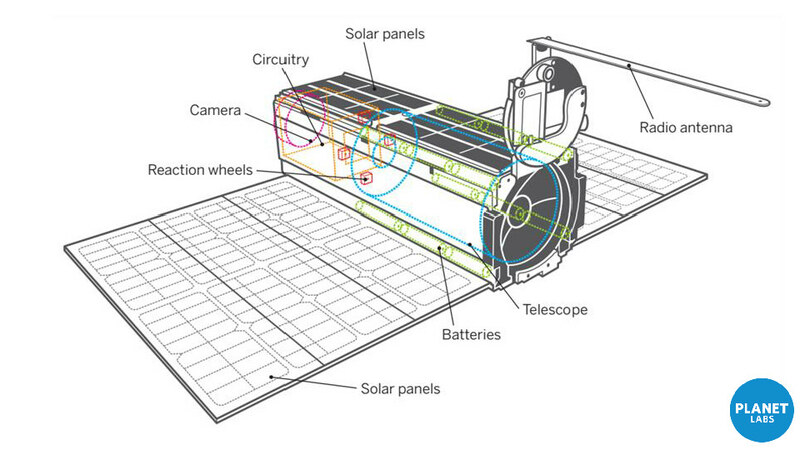 NASA ISARA has solar cells opposite the reflectarray. 3 × 3U panels achieve 33 dB of gain at 26 GHz and data rates about 100 Mbps. Launched and deployed in 2018. 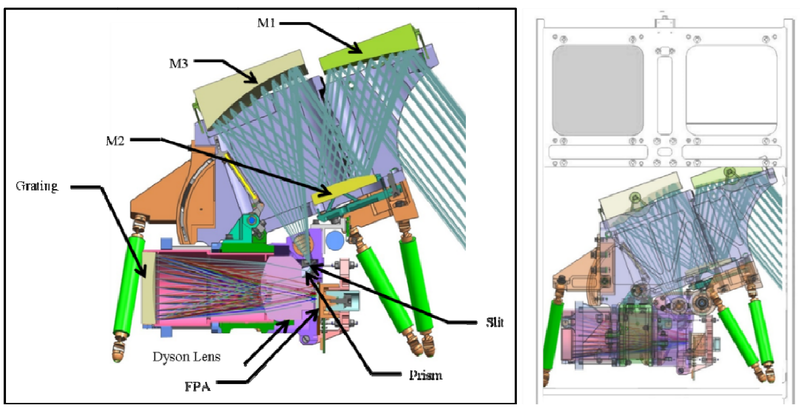 Pumpkin High‐Power Articulated Solar Array for Lunar 6U CubeSats. 126W BOL. Compact Satellite Bus Planet Bus is a wrap-around design of about 0.25U - 0.5U total volume. Includes star camera, GPS, 4 reaction wheels. Also includes 3 magnetorquers, UHF transceiver, X-band transmitter, S-band receiver, low-power x86 processor and 0.5 TB of storage. 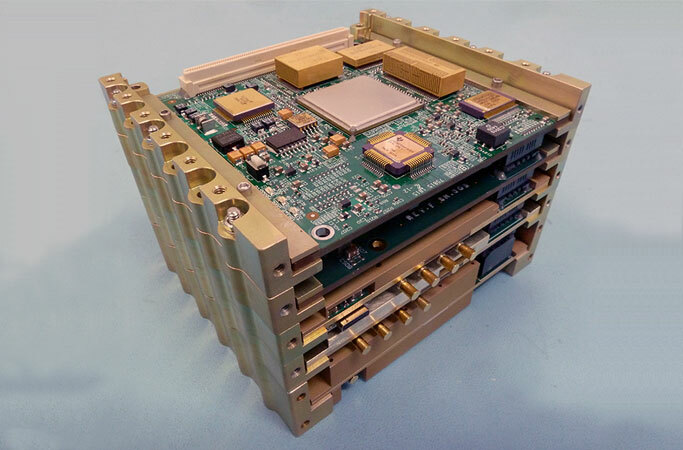 Tyvak Intrepid platform avionics, power system, communication, and payload interface are all hosted in a 9 × 9 × 3 cm package. 400 MHz ARM processor, 512 MB storage, 64 MB RAM, embedded Linux, integrated power regulation system, sensor suite, low profile UHF radio. 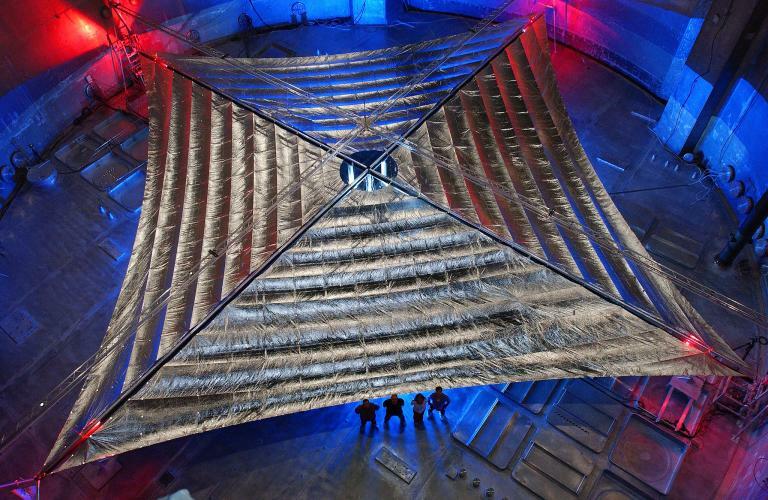 Propulsion NASA Solar sail with an area of ~86 m2 that fits into 2U and has 2.5 kg mass. Busek BIT-3 propulsion sized 2.5U includes 1.5 kg solid iodine propellant and will provide 6U CubeSat up to 3 km/s of delta-V. Phase Four CubeSat Ambipolar Thruster (CAT) sized 4U could provide 8 km/s of delta-V for 6 kg dry mass satellite consuming 2.56 kg of water. $1 million contract from DARPA to deliver TRL 7 engine. Deep Space Industries Comet-1 thrusters are simple, safe, and cost-effective electrothermal propulsion systems that use water as propellant. As of Q3 2016, six flight units have been ordered for Q3 2017 delivery. VACCO Variety of high-performance cold gas, warm gas and green monopropellant thrusters. More than 14 flight MiPS have been produced. 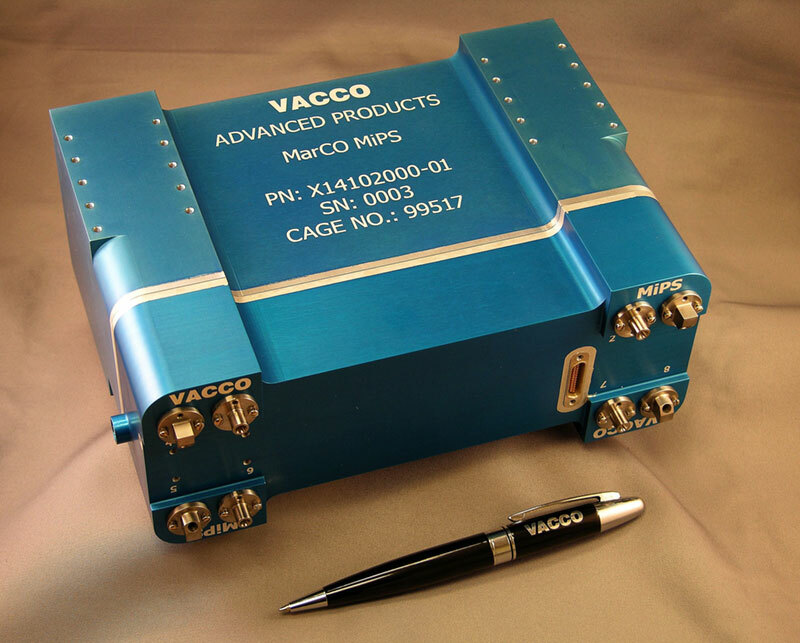 VACCO developed modules flying on MarCO to Mars. 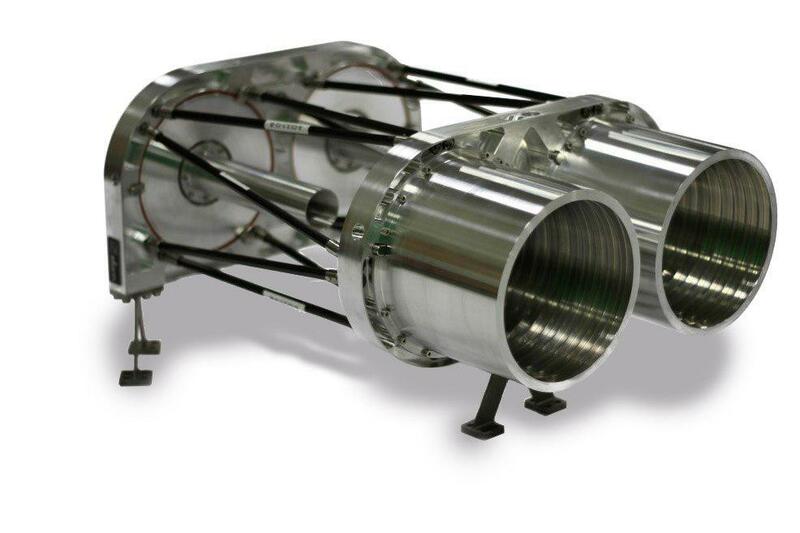 Enpulsion IFM Nano Thruster uses liquid metal as the propellant, which is at solid state at room temperature. Flown on Planet's Dove Pioneer spacecraft in 2018. Booms Oxford Space Systems AstroTube retractable boom with up to 3 m length and less than 0.5U size. Visible and near-IR cameras Determine asteroid’s shape, rotational properties, spectral class, local dust and debris field, regional morphology and regolith properties. Planet Scope PS2 29 MP detector capable of taking images with 3.7 m ground resolution and swath of 24.6 km × 16.4 km from 475 km altitude. 4 Band imager with Two-Stripe NIR filter. Can be a single RGB or a split-frame (RGB half and a NIR half). 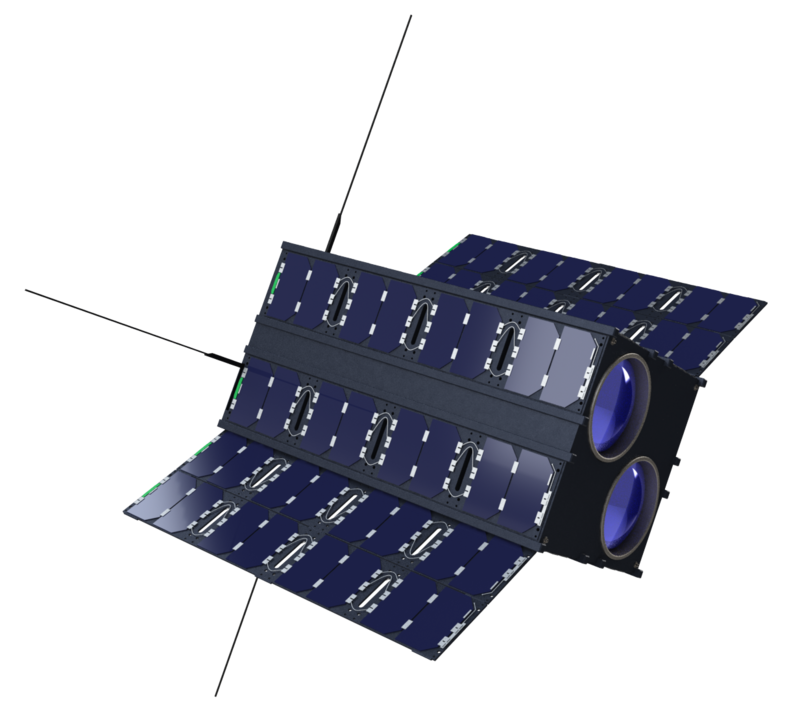 Hera Systems 1-meter resolution imaging satellite is built on a 12U cubesat, 22-kilogram form factor. First launch now expected in 2019. Delayed from 2016. Astro Digital (Aquila) 6U has 22 m resolution in RGB and NIR. 16U has 2.5 m resolution in RGB, red edge, and NIR using 70 MP sensor and butcher block filter. 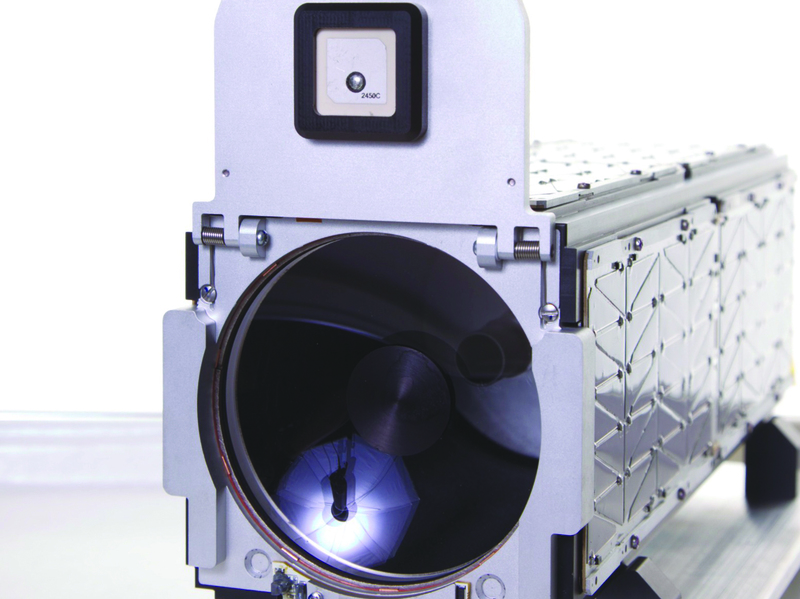 Malin Space Systems ECAM C-50 imager uses the Aptina MT9P031 sensor certified for deep space. 5 MP (2592 x 1944) CMOS. JPL IntelliCam 20 MP, 15 deg FOV. 10 cm/pix at ~800 m. Asteroid (~5-12 m) detection from ~50K km. Science and optical (autonomous) naviation. Flight on NEA Scout. Based on Mars 2020 rover EECAM and OCO-3. 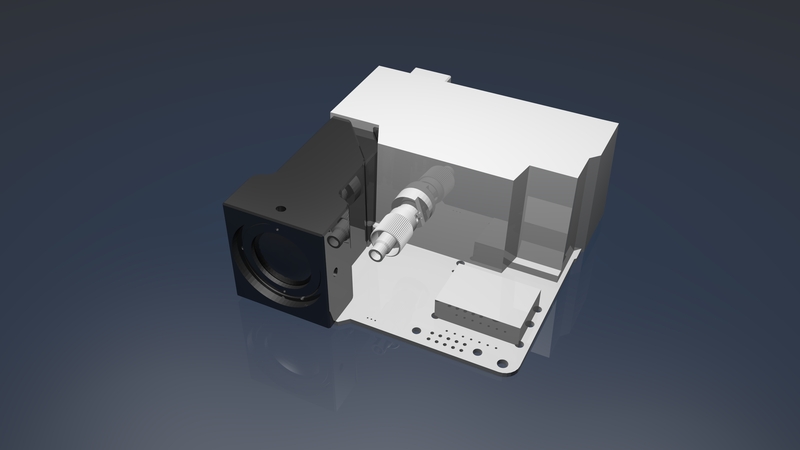 SATLANTIS iSIM 90 Imager for 12U/16U with up to 1.1 m GSD @ 500 km altitude and 11 km swath width. Dimensions 210 x 250 x 155 mm. 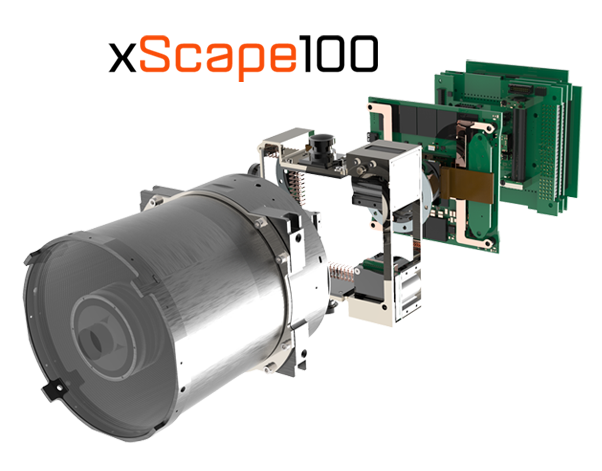 Simera Sense xScape100 2U imager for 3/6U with 94 mm aperture. Microwave radars Precipitation profiling NASA KaPDA Ka-band antenna KaPDA parabolic deployable Ka-band antenna with 0.5 m diameter, 1.5U stowed size, 1.2 kg mass and 42.5 dB gain. Radiometers Greenhouse gases measurement. Atmosphere humidty and temperature profiling. Boulder (BEST) 150 and 183 GHz Radiometers 150 GHz radiometer has 2 channels between the 118 GHz oxygen absorption line and the 183 GHz water vapor absorption line. Consumes less than 1 W of power and its weight is about 100 grams. 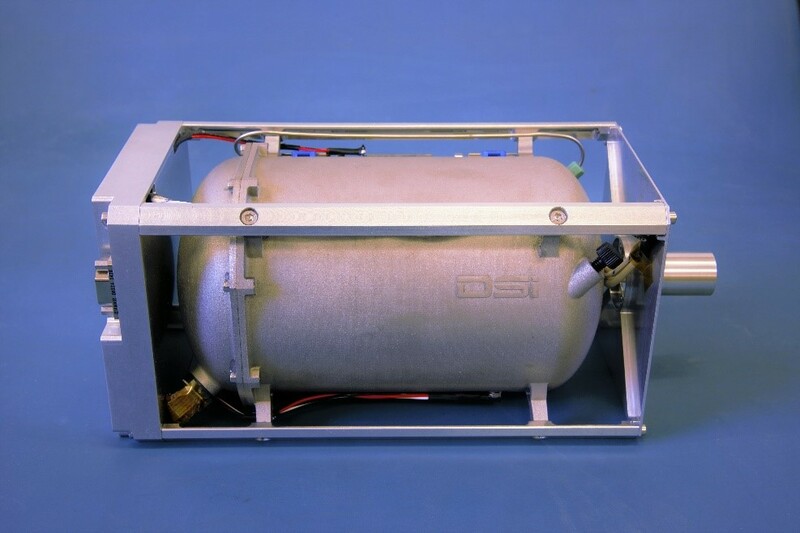 NASA Laser Heterodyne Radiometer (Mini-LHR) 4U occultation-viewing passive radiometer that measures methane (CH4), carbon dioxide (CO2) and water vapor (H2O) in the limb. Will be flying on Mini-Carb in 2019. Infrared imagers Characterize volatiles and minerals. Measure temp and water vapor in atmosphere. Night-imaging, temperature mapping. NASA BIRCHES 1.5U, 2.5 kg, 5 W. Spectral resolution (5 nm) to characterize volatiles (water etc) and minerals (oxides etc). Micro-crycooler to keep <140 K. Will fly on Lunar IceCube in 2020. 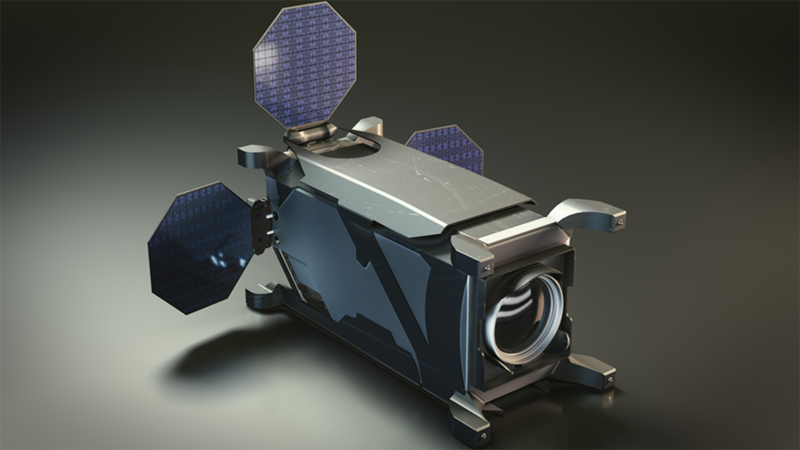 Compact version of the volatile-seeking spectrometer on New Horizons. Thoth Argus 1000 Infrared Range: 1000 nm - 1700 nm. Spectral resolution: 6 nm. 15 mm aperture, 0.15° FoV. Envelope: 45 × 50 × 80 mm. Mass < 230 g. First flown in space in 2008. MWIR Grating Spectrometer (CIRAS) Spatial: 13.5 × 0.32 km. Spectral: 4.8-5.1 μm. 625 Channels. HOT-BIRD detectors comparable to HgCdTe at much reduced cost. 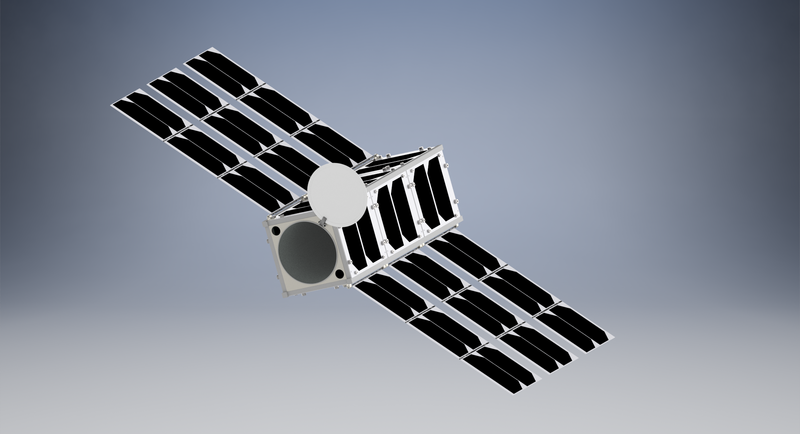 Will fly on 6U CubeSat also called CIRAS in 2019. 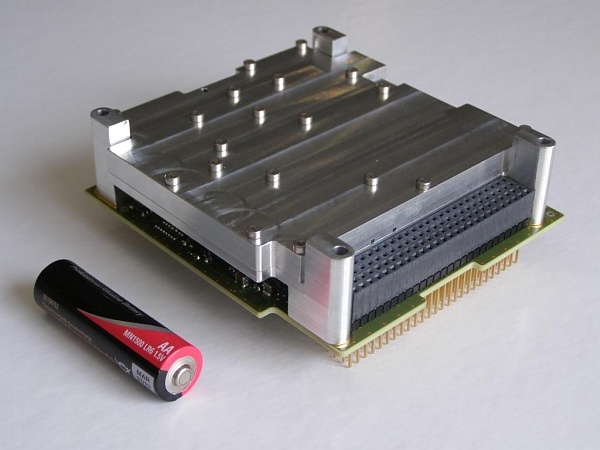 Cryocooler by Lockheed Martin is smallest available. 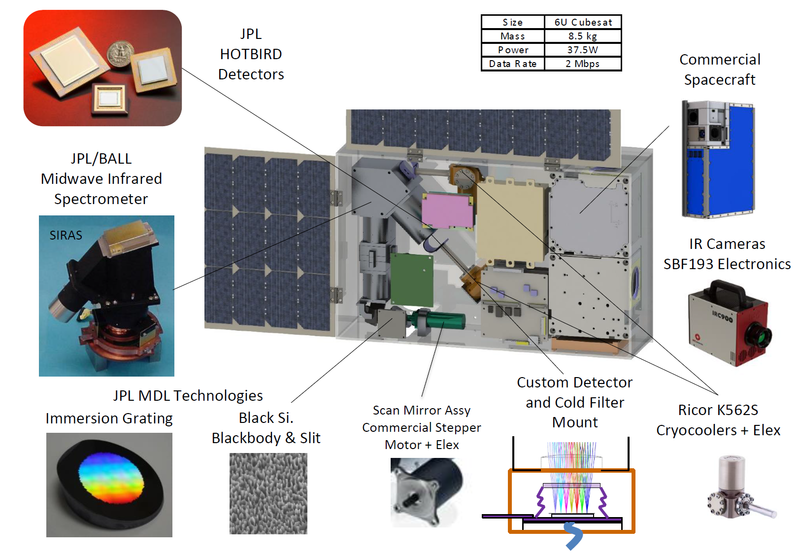 Planetary Resources MWIR Midwave infrared imager (MWIR) in 3-5 μm with 15 m ground resolution. Arkyd-100 is cancelled. Status unknown. Hyperspectral imagers / spectrometers Material detection, crop identification, soil moisture, oil spill concentrations, monitoring pollutatns, hazardous gases. 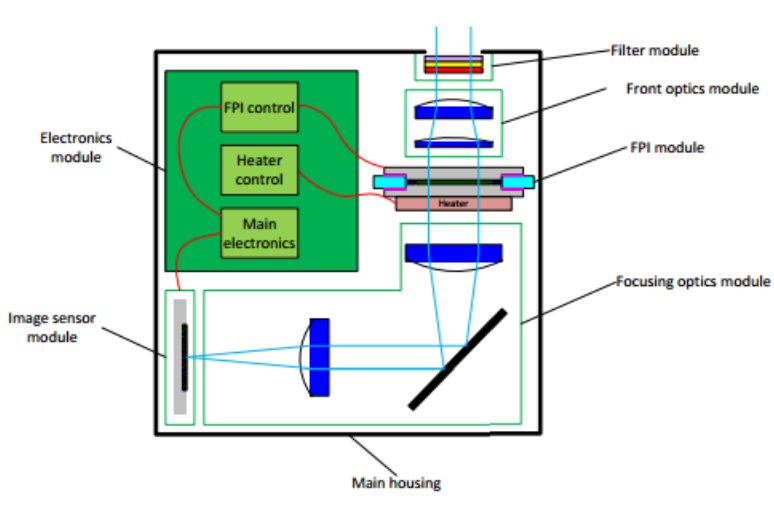 Harris Fourier Spectrometer (CubeSat-FTS) 4 cm aperture, MWIR band only (5.7-8.3 um). Cooled to ~120K using an AVHRR-based passive cooler. Hundreds of hyperspectral bands. Flight in 2019. More affordable and efficient 3D wind data sets. Utah State University provides spacecraft. Planetary Resources VNIR Visible-NIR 40 channel hyperspectral imager with 10 m resolution. 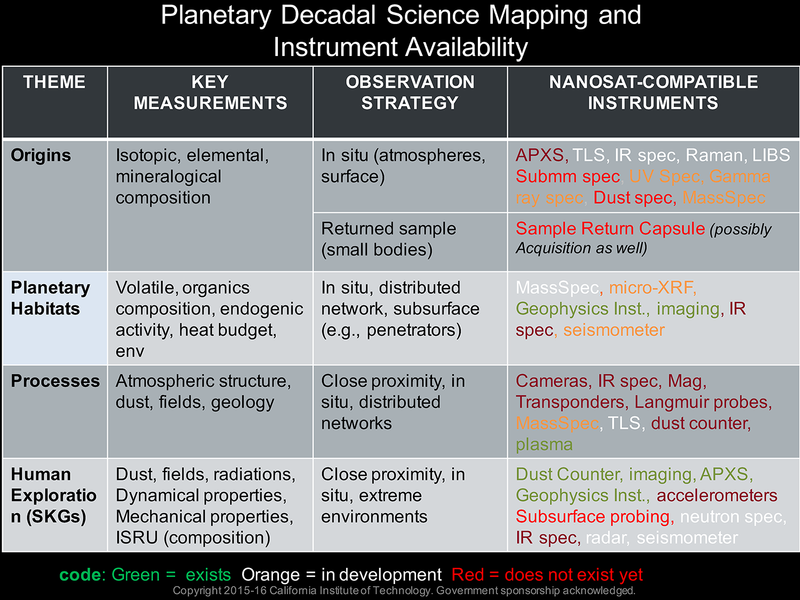 Planetary Resources CHAP Visible, NIR, IR and far-UV (90-140 nm) possible, 400 channels. Co-registration of spatial and spectral information. 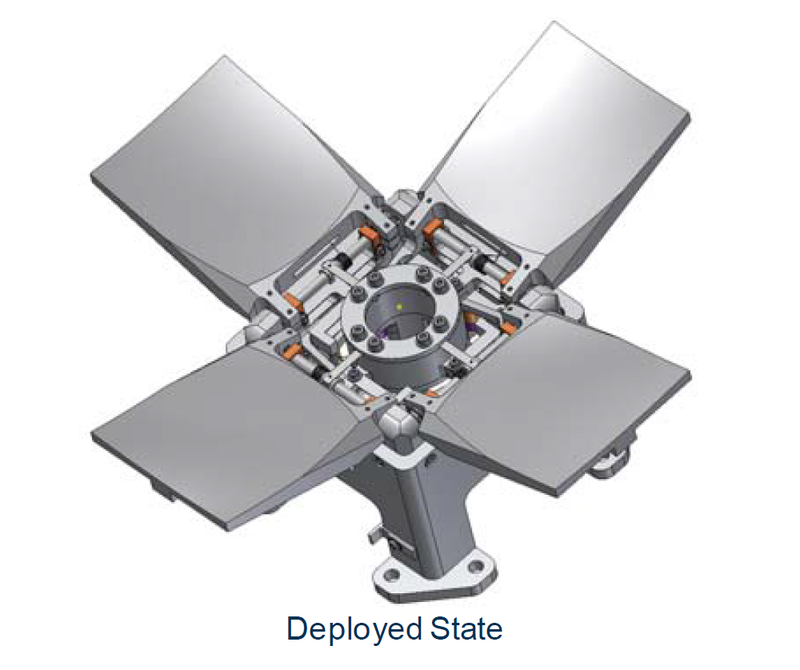 NASA SBIR Phase II contract. VTT VISION Tunable spectral imager operating in the visible and near-infrared spectra (430 – 800 nm) for ozone vertical profile measurement. Based on VTT Fabry-Perot Interferometer technology and Aalto-1 spectral imager. ESA Mini-TMA 90 m ground resolution, 565 km swath, 400-800 nm range, 300 channels, 15 nm spectral resolution, 150 g, 60 × 50 × 30 mm. Miniaturisation of Proba V design. Prototype engineering model was built by Dutch company VDL ETG. 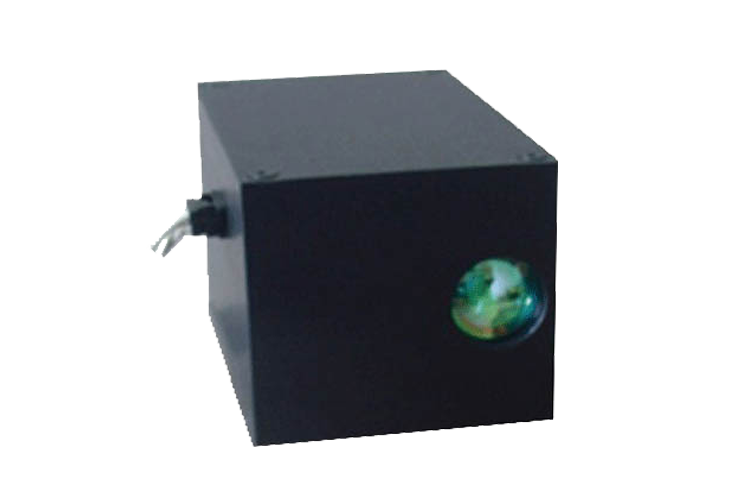 Snow and Water Imaging Spectrometer (SWIS) 4U, 1.9 kg, 350-1700 nm region with 5.7 nm sampling, 10 deg FoV, 160 m resolution from 500 km. cosine HyperScout 1U, 1.1 kg, 11W, 400-1000 nm in 45 bands, 40 m resolution and 164 km swatch from 300 km. 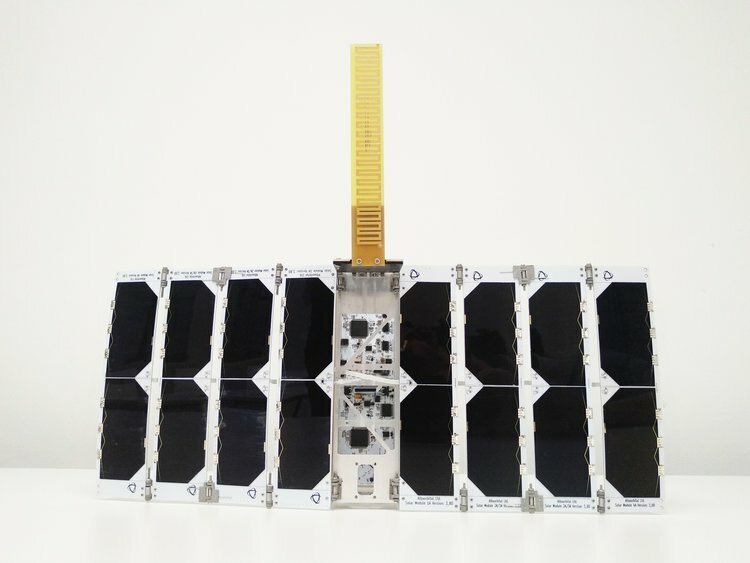 Flown on GomX-4B CubeSat in 2018. 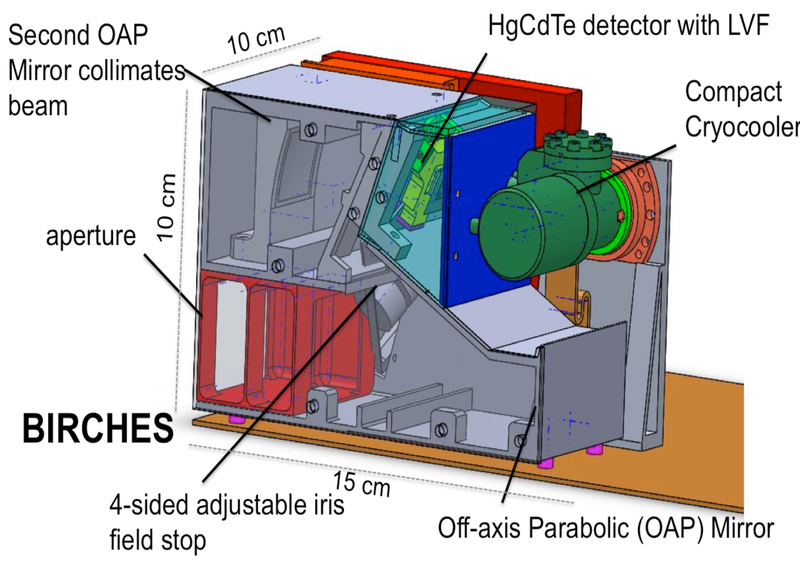 Neutron spectrometers Map hydrogen (and water) abundances NASA Mini-NS (Neutron Spectrometer) 2.5U detector using Cs2YLiCl6:Ce (CLYC) scintillator material to detect epithermal neutrons at spatial scales below 10 km. Flight in 2020 on LunaH-Map to understand the relationship between hydrogen and permanently shadowed regions. 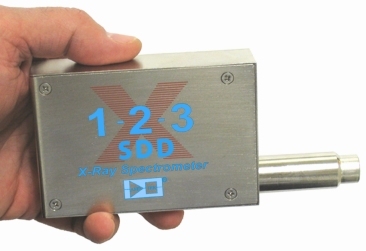 X-ray Chemical composition, pulsar navigation Amptek X-123SDD 7 × 10 × 2.5 cm, 180 g, 2.5 Watts, solar SXR spectral measurements in the 0.5-30 keV range (0.04-2.5 nm) with 0.15 keV energy resolution. Flew on MinXSS 3U CubeSat. Planned for 6U CubIXSS plus X123-CdTe. XR-100SDD flies on OSIRIS-REx. REDLEN M1770 Precise measurement of the cosmic (diffuse) X-ray background in the 20 – 50 KeV range. Will launch on CXBN-2. 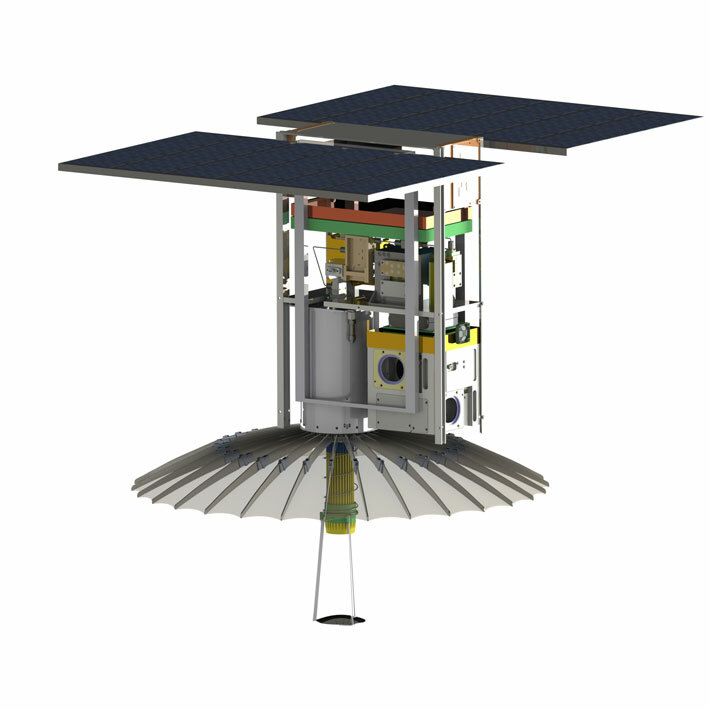 Lobster Eye X‐ray telescope Wide‐field optical system for X‐ray monitoring in range 3 ‐ 40 keV, based on Lobster Eye optics and Timepix detector Will launch on 2U VZLUSAT-1 with QB50. Mass spectrometer Elemental composition Quadrupole Ion Trap Mass Spectrometer (QIT-MS) 2.5 kg, 2U, isotopic accuracy <1%. Leverages foldable edge-connected electronics. 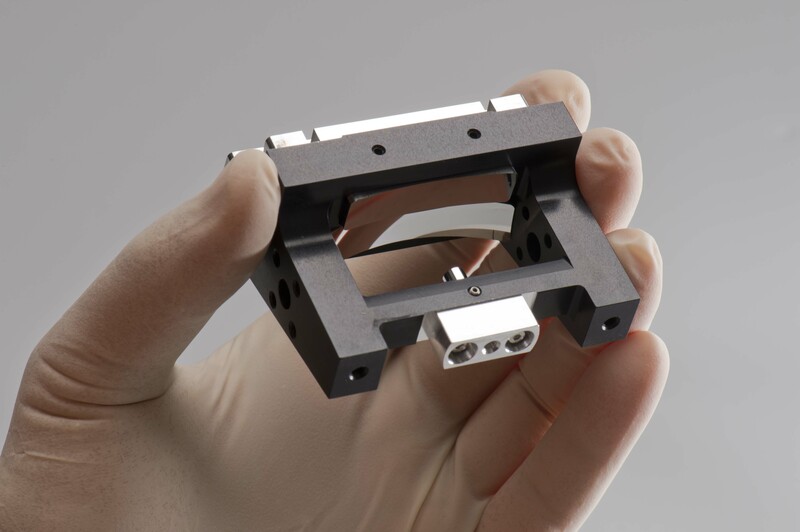 Gamma ray spectrometer Sub-surface composition Miniaturized SrI2 Gamma Ray Spectrometer 1U, 0.5 kg, 3 W. Europium-doped strontium iodide (SrI2) crystal is 15 × 15 × 10 mm. Many future space science mission concepts in Keck Institute Final Report from 2014. 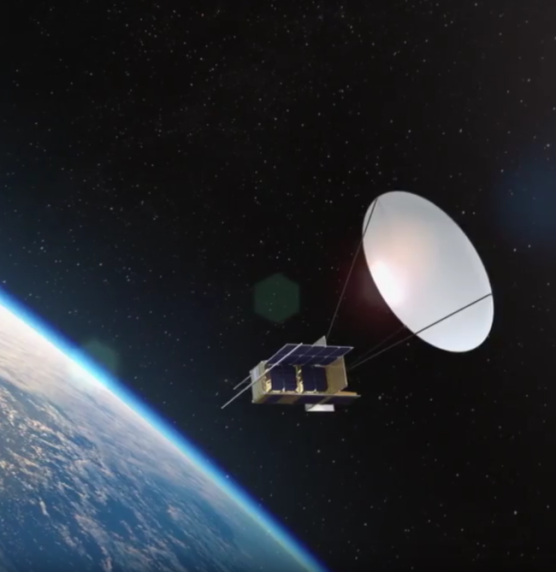 Communications Structureless antenna Under funding from DARPA, Tethers Unlimited is developing technology that will enable new capabilities for small, low-power nanosatellites such as transmission of real-time video from GEO. 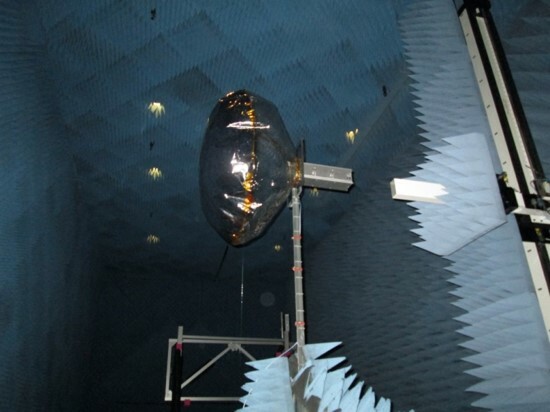 Inflatable antennas NASA JPL is leading the development of inflatable X-band antenna with 34 dBi gain, 0.5U stowage volume that uses sublimating powder and is highly scalable. Arizona State University is also involved. Optics 6U Collapsible Telescope NASA Ames 6U Collapsible Telescope primary mirror diameter is 152.6 mm (6 inches). Fits into 13.8 cm × 20.3 cm × 7 cm. 3U Folded Telescope UK Astronomy Technology Centre solution estimated resolution from 300 km altitude is about 0.5 m per pixel with a 3U CubeSat. Volume of the folded system is 1.5U. 3U Deployable Telescope Utah State University solution ground sampling distance is 1.3 m. The rectangular full field of view is 0.7° by 0.5° giving a ground coverage of 6.1 km by 4.6 km from a 500 km altitude with a 3U CubeSat. 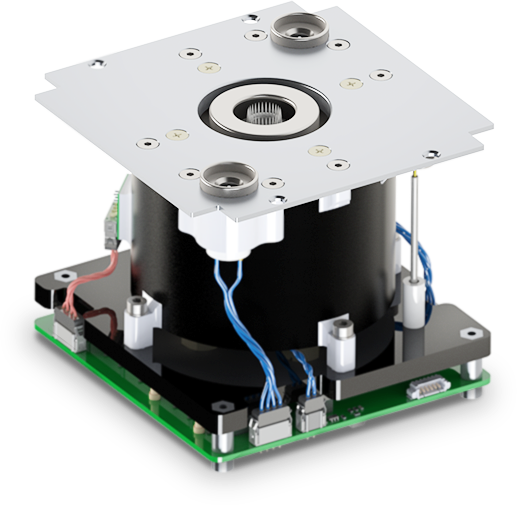 Fits within a 2.5U volume, but length can be reduced to 175 mm. Carbon-nanotube mirrors with integrated actuators Made of carbon nanotubes embedded in an epoxy resin. Lightweight, highly stable, easily reproducible and do not require polishing. Just pour the mixture of epoxy and carbon nanotubes into a mandrel or mold and let it cure and harden. 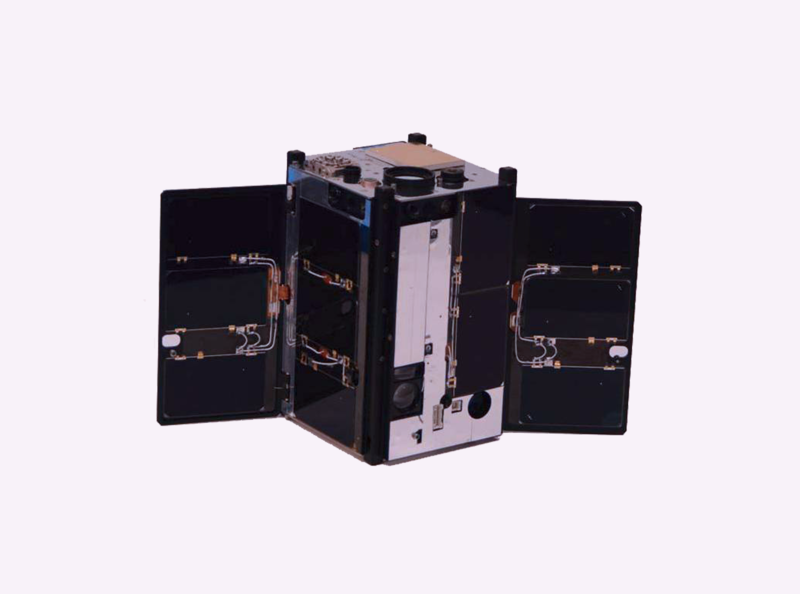 6U SRI CubeSat Imaging Radar SRI-CIRES is designed for 500 km altitude, 2.9 GHz S-band, 25 m spatial resolution, 3.2 × 1.6 m. Module volume less 1U and < 1 kg. Interferometric SAR (InSAR) for Earth science. NanoSAR Antenna is 1.14 × 0.18 m, 5.8 GHz frequency. Swath width of 60 km and pixel size of 10 × 3 m from 350 km altitude. Study by Delft from 2012. Multi-Purpose CubeSat at ISS ESA study lead by Tyvak will include refueling from ISS and autonomous inspection of ISS. Power Thin film solar cells Enable much larger solar panels (blanket arrays) in the same volume and mass that can be folded or rolled. Alta Devices 2U concept can produce 29W with much room to grow using their record efficient and bendable cells. 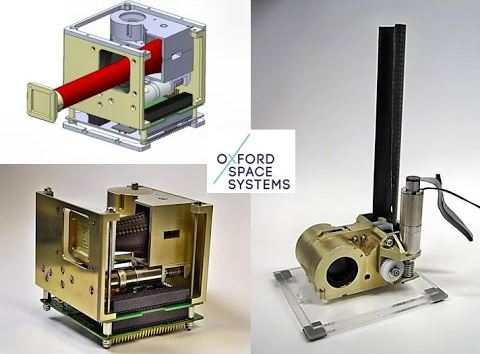 Radioisotope thermoelectric generator (RTG) PocketRTG is a study by University of Bristol for a CubeSat-scale RTG using COTS fuel. Measures 0.5U and mass is 0.5 kg, but output is currently only 50 mW. Also studied by NASA Glenn for Lunar missions in permanently shadowed regions. 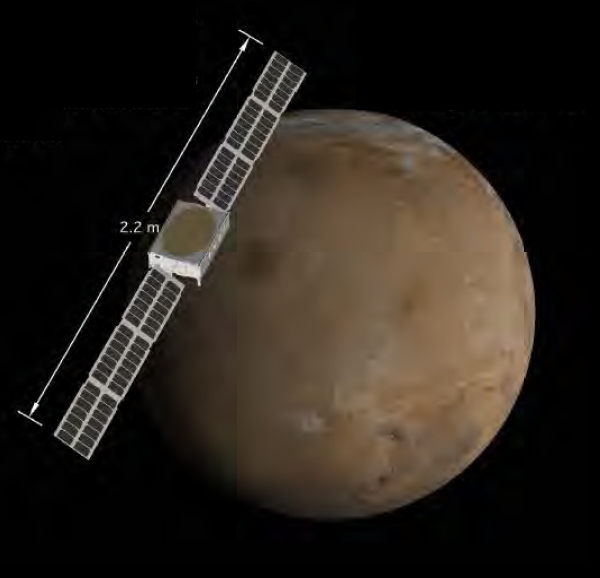 Missions Mars Micro Orbiter 6U Cubesat to measure the Martian atmosphere in visible and infrared wavelengths from Mars orbit. Can also act as orbital communication relay for surface-based missions. 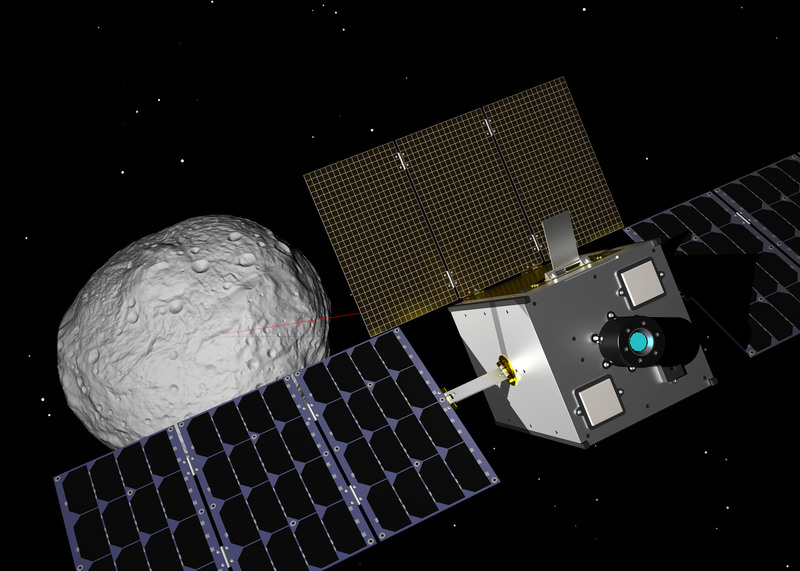 DAVID 6U CubeSat will flyby an asteroid much smaller than any investigated by now. 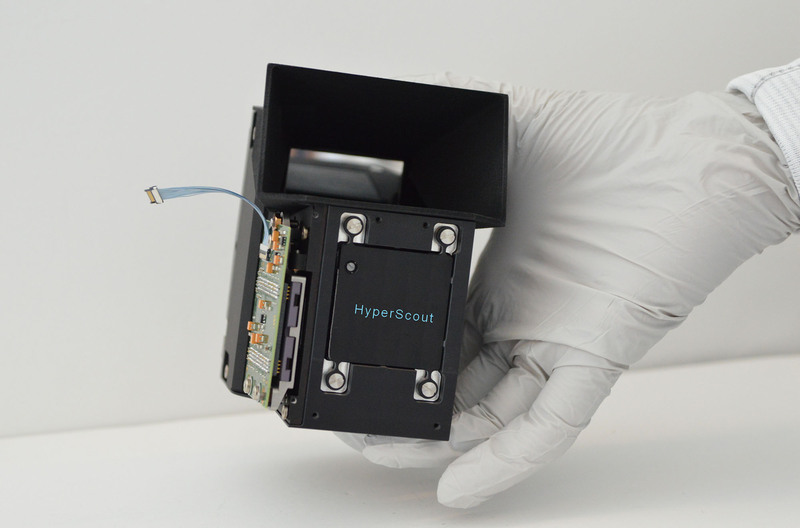 Instruments are wide-field camera, a narrow-field camera and a point VNIR spectrometer. 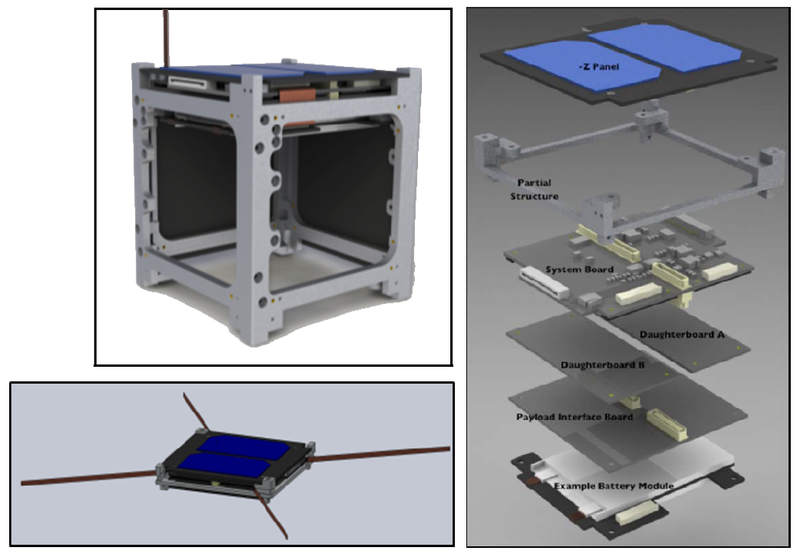 L5 Space Weather Sentinels (L5SWS) One Keck Institude study proposes fractionated space weather monitoring from the Sun-Earth L5 point with 5 × 6U CubeSats. One is telecom and others would carry specific instruments. 98 m2 solar sails are used to enter orbit and perform station keeping. Propulsion Antimatter propulsion by Positron Dynamics Core innovation is the ability to generate intense beams of cold positrons using proprietary array moderators combined with compact radioisotope sources of positrons. 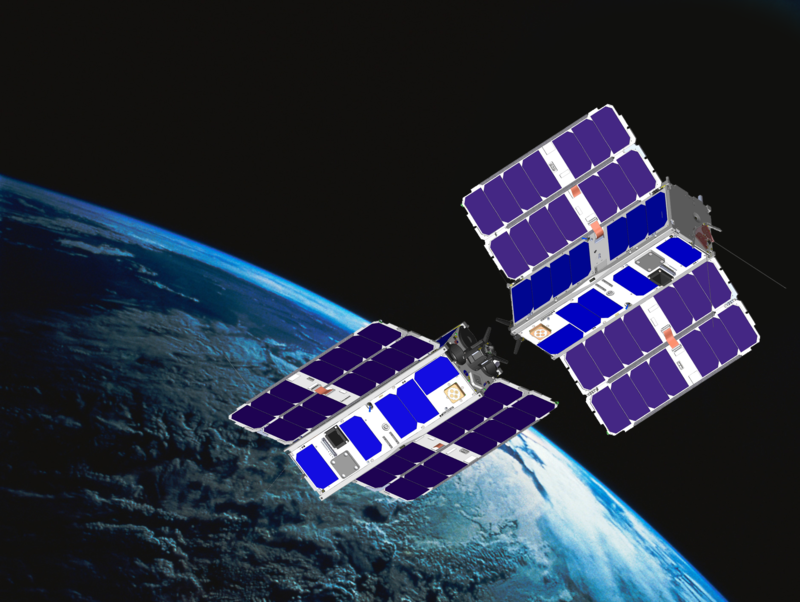 First 6U CubeSat test planned for 2016, will have delta-V betweem 1 to 10 km/s. 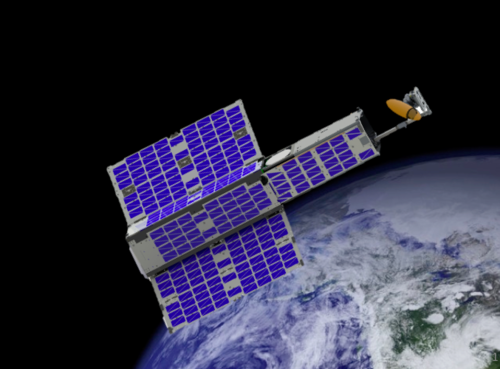 Terran Orbital / Tyvak 121+ 2003 CubeSat integrator for most US Gov. missions. Launches include organized by Cal Poly. NASA CSLI and ELaNa 46+ 2011 Free For US educational, NASA and non-profit CubeSats. Different rockets used. ESA Fly your Satellite! 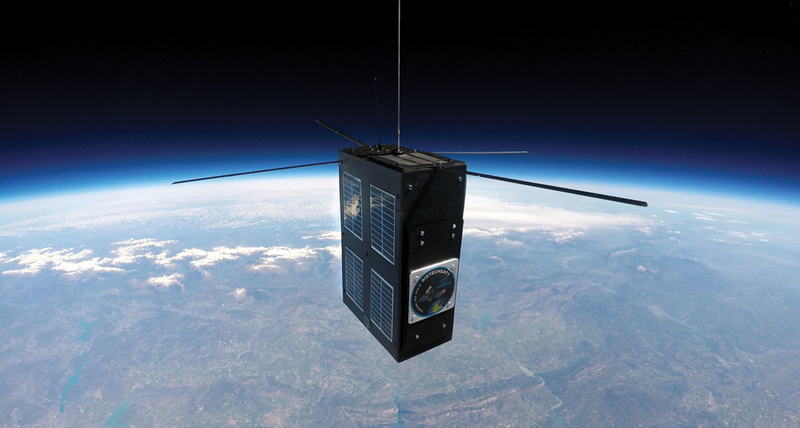 10 2012 Free European educational CubeSats. Used to be with Vega. ISS orbit from now on. 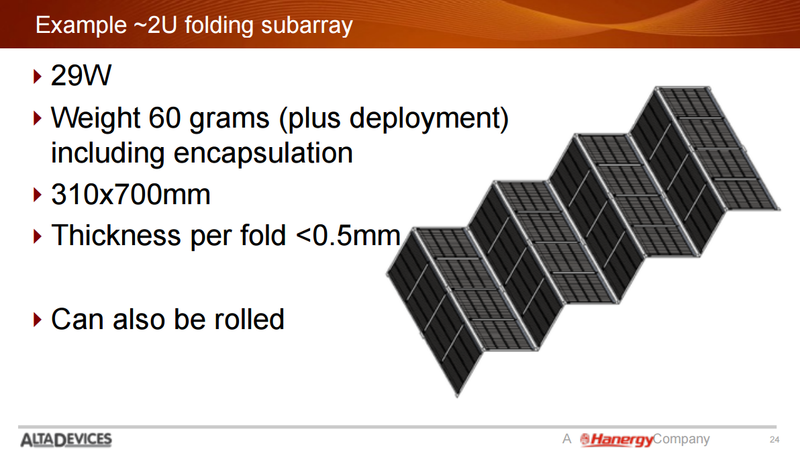 Nanoracks 180+ 2012 $85,000 for 1U Only deployed from ISS. Now up to 1x6U and soon up to 12U. G.A.U.S.S. 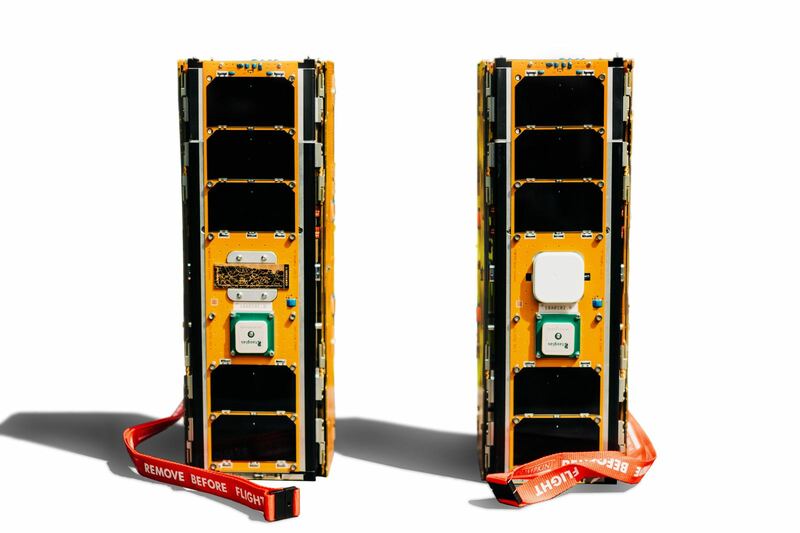 12+ 2013 Only available launches for PocketQubes from UniSat microsatellites. ECM Space 30+ 2017 ? Have their own 12U and 16U deployers. KiboCUBE (UNOOSA, JAXA) 3+ 2018 Free Provide ISS launches for educational or research institutions from developing countries. Alba Orbital 0 2019 PocketQube 1p $30,000, PocketQube 2p $47,000, PocketQube 3p $70,000 Upcoming regular PocketQube launches. TriSept 11+ 2018 ? One of the NASA ELaNa launch integrators. ULA (United Launch Alliance) 0 2019 Free 6 units planned for now. Only for U.S. colleges and universities. Virgin Orbit 0 2019 Assuming $10 million and 40 CubeSats gives $250,000 per 3U. Sky and Space has contract for 4 launches. Vector Space 0 2019 First launch with PocketQubes. ICEYE has booked 21 launches from them. D-Orbit / InOrbit NOW 0 2019 ? First launch on Vega in the first half of 2019.
bSpace 0 2019 $80,000 for 1U, $220,000 for 3U, $450,000 for 6U, $945,000 for 12U Up to 27U with a 200U capacity on each launch from ISS. Captured in 4k 360 degree virtual reality. Goonhilly / SSTL 0 2019 $1.3 M per kg Lunar orbit in future. Precious Payload 0 ? 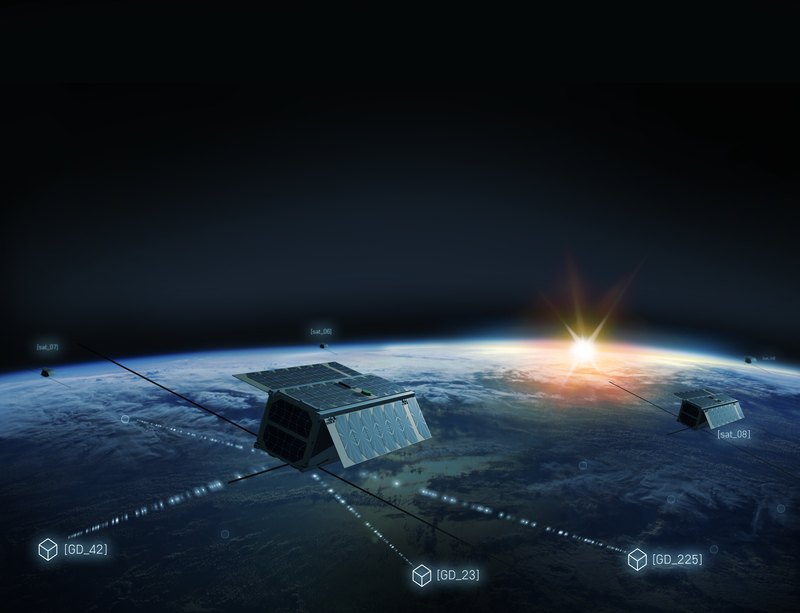 Global launch reservation system for small satellites. Space BD 0 ? Selected by JAXA for Kibo. Mitsui 0 ? Selected by JAXA for Kibo. SSL 0 ? Rideshare to GEO. NOAA 0 2022 Rideshare to GEO. New launchers will be added here when they are very close to commercial missions because there are too many small rockets in development as seen from NewSpace Index. There are many more providers and special (free) launch opportunities and competitions. e.g. 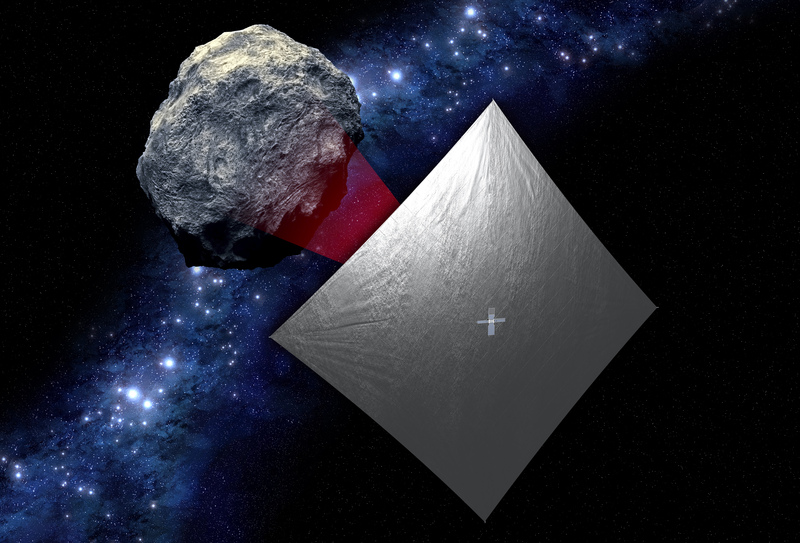 with SLS to Moon through Cube Quest and with ESA AIM to Didymos asteroid. 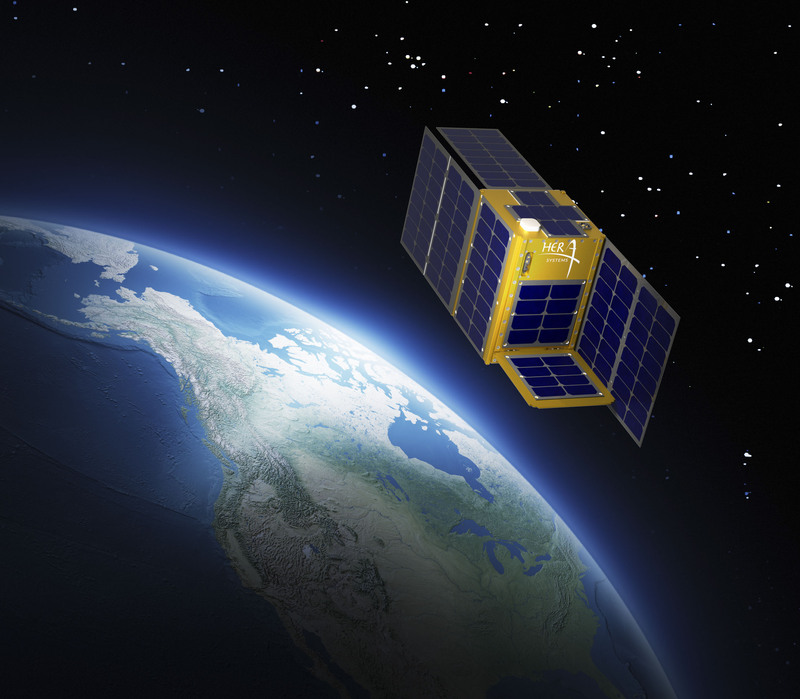 Most nanosatellites from Japan, India, China and Russia are launched by their space agencies.